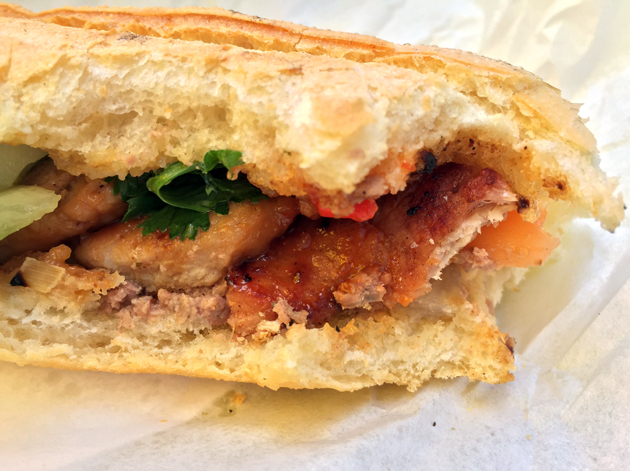 My 2014 group test of banh mi eateries proved to be one of my most popular Best and Worst round-ups – and also one of the most contentious, as some of the ill-tempered Comments attest. I’m quite thick-skinned though and I take such vehement, blinkered criticism as a sign that I’m onto something. 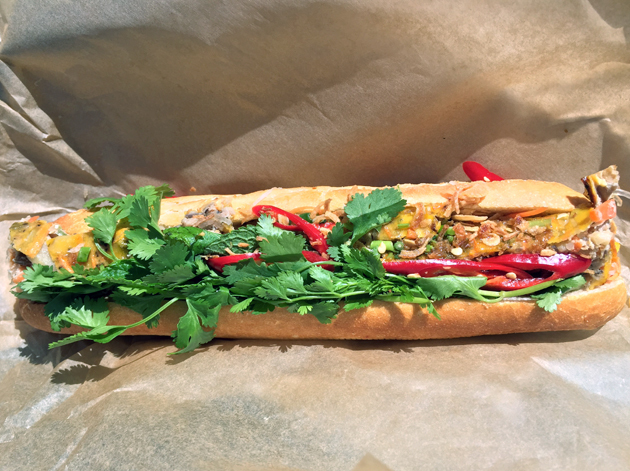 Of course, that’s not the only reason I’ve written this banh mi update – a number of new restaurants, cafes and take-out joints have sprouted up across London offering Vietnamese sandwiches and I’ve tried them all. 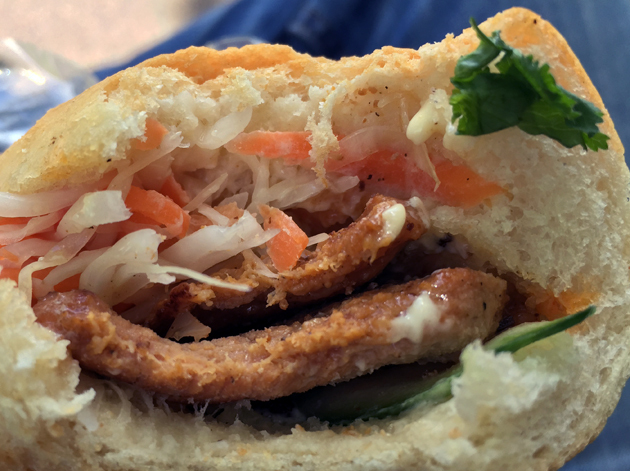 For a primer on what a banh mi actually is, and what I consider to be a good one, I’ll refer you back to my original group test – it’s more complicated than you might think. Otherwise, it’s straight on to the reviews. Banh Mi Bicycle bears no relation, as far as I can tell, to the similarly named Bicycle Banh Mi in San Francisco. I’m not sure what’s odder – that Banh Mi Bicycle has no online presence to speak of, or its lonely weekday lunchtimes-only location on Clifton Street with only Backstreet Diner for company. 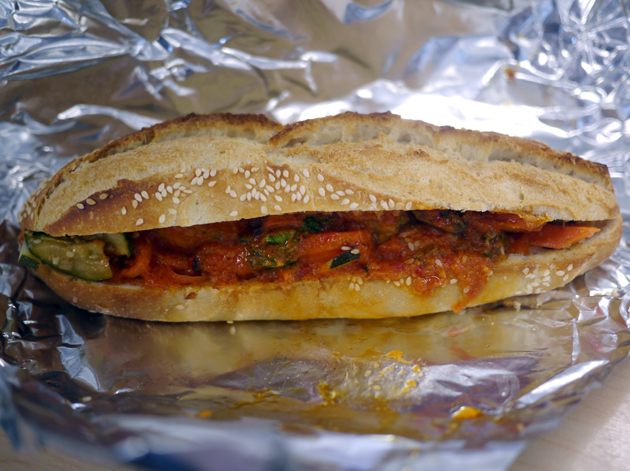 All of Banh Mi Bicycle’s sandwiches are on the small side, which made scoffing two in one sitting almost mandatory. Although the baguettes used were light and airy, they were also a little too chewy for my liking. The pepper pork loin was tender and had the requisite kick of the black seasoning. The daubing of pale, bland pate was inconsequential, leaving it to the punchy chillies and Sriracha sauce to pick up the slack. The most interesting element of all was the mayo with its zesty lemongrass notes. 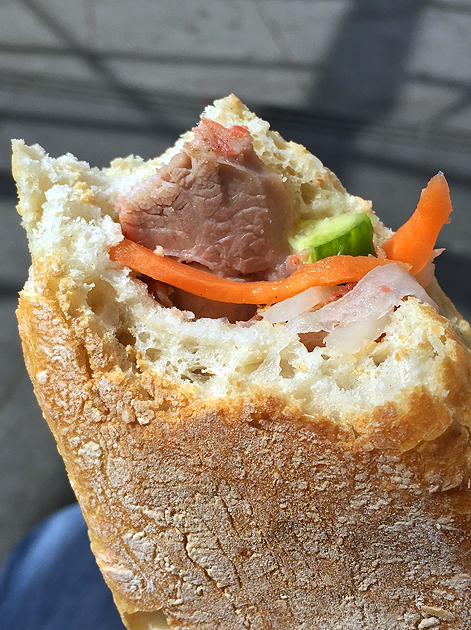 Vietnamese baguette from Banh Mi Bicycle. The honey roast pork filling wasn’t that different from the pepper pork loin, with only a mild sweetness and light charring to its name. The Hanoi chicken merely swapped out the swine flesh for some moist, but ultimately forgettable poultry strips. Both leaned heavily on the chilli slices and zesty mayo. 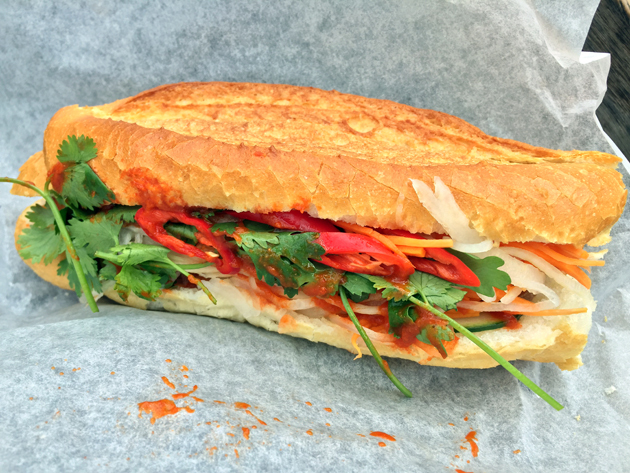 If Banh Mi Bicycle put as much effort into its fillings and breads as it did into its spicy garnishes and mayonnaises, then it’d produce some truly cracking sandwiches. As it is though, they’re merely average overall. 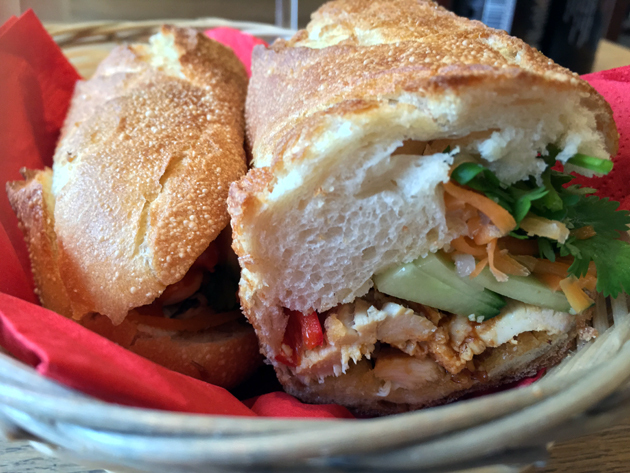 Although Banh Mi Town is located on a quiet Fitzrovia side street, it doesn’t seem to have any trouble attracting business from a steady stream of office workers and students from a nearby campus of the University of Westminster. 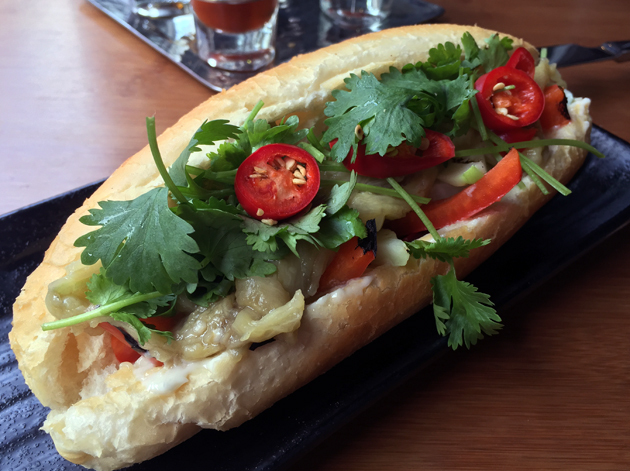 All of the banh mi used small, but consistently crisp, light and airy baguettes. The fillings tended to be much more variable in quality though. The chicken satay, beef and tofu fillings were the weakest on the menu. The satay sauce tossed over the chicken was essentially sweet coronation chicken sauce, but with some added nuttiness. The tender chicken was fine, but the one-note richness of its sauce really needed stronger pickled veg to act as a counterpoint. Tarter pickled daikon and carrots turned up in the beef variant, but there weren’t really needed here as the thin, anonymous slices of beef didn’t taste of much. Oddly, the thin, heaped slices bore a passing resemblance to doner kebab meat. It was at least moist, unlike the very dry and bready tofu. Far better were the pair of pork-filled baguettes. The grilled pork version didn’t use fatty strips as I was expecting, but mildly coarse mince instead. It was only lightly caramelised and the accompanying pate was only moderately earthy, leaving it to the mayo to pick up the slack with its creamy umaminess and occasional hints of lemongrass. 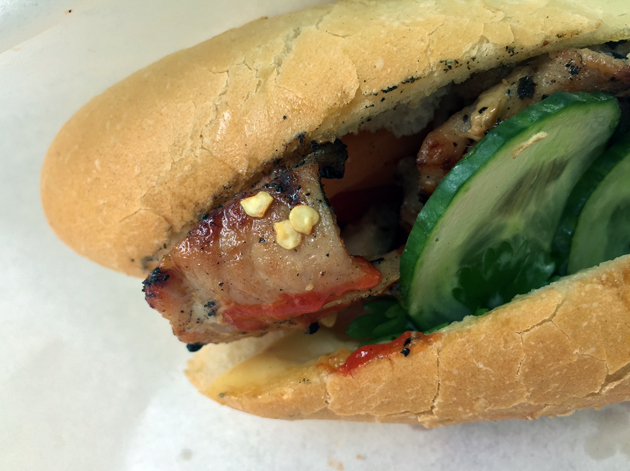 The second pork banh mi was filled with chunks of tender, reasonably milky flesh topped with lightly spiced bark tinged with soy sauce-like saltiness. 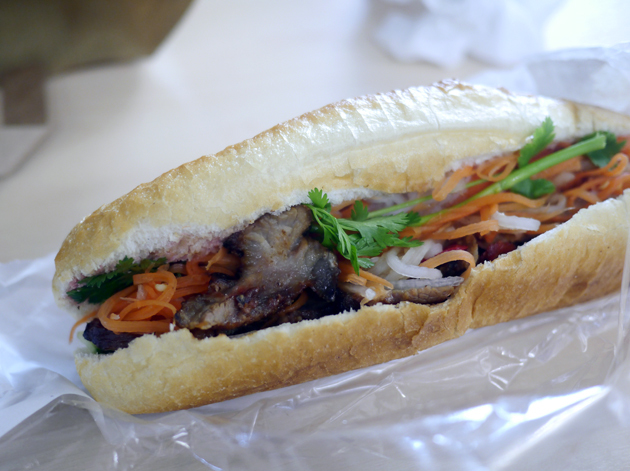 Although its flavours could’ve been bolder, this was still my favourite of Banh Mi Town’s sandwiches. Although not strictly a banh mi, it would remiss of me not to mention the occasional special of beef stew served with a baguette on the side. The thin stew was more of a soup. A touch oily with a slight hint of herby bitterness and a tomato-dervied umaminess, the stew was also dotted with unctuous, tender chunks of beef as well as sweet pieces of carrot and turnip. Scooping up the stew with chunks of bread was just as enjoyable as constructing a crude, somewhat messy DIY sandwich. 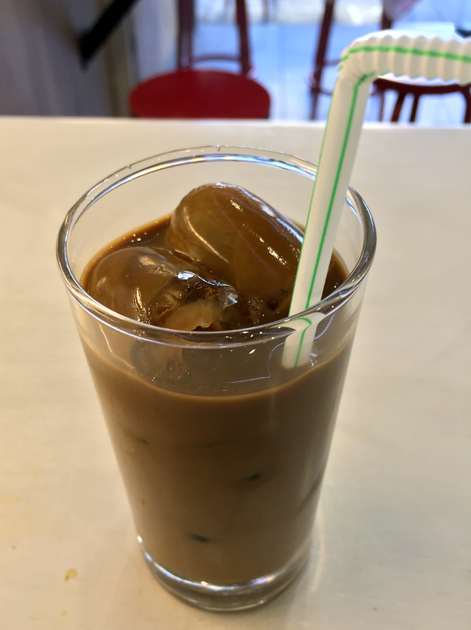 Sadly, Banh Mi Town’s iced coffee was consistently watery and flavourless no matter the amount of condensed milk specified. 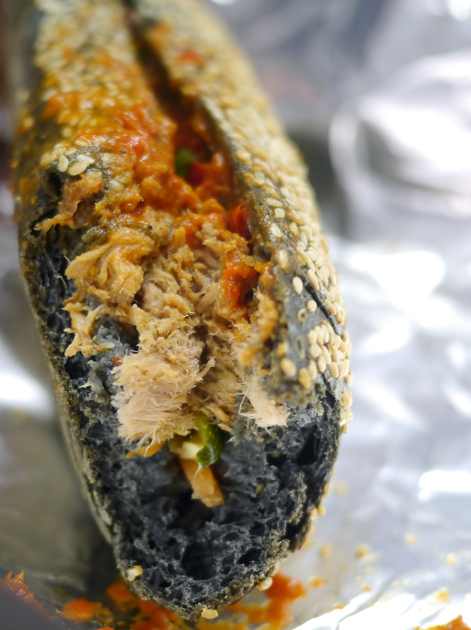 Banh Mi Town needs some better quality fillings to go with its top notch bread. 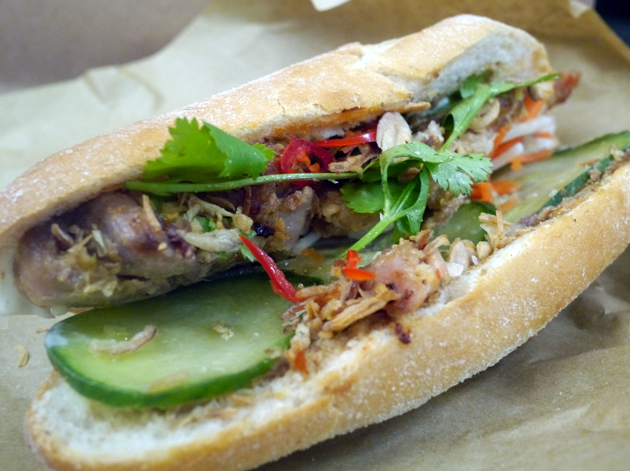 Until then, its banh mi are decidedly middle of the road compared to much of the competition in Fitzrovia. Its only real edge is that it’s open on weekday evenings, unlike its local rivals. 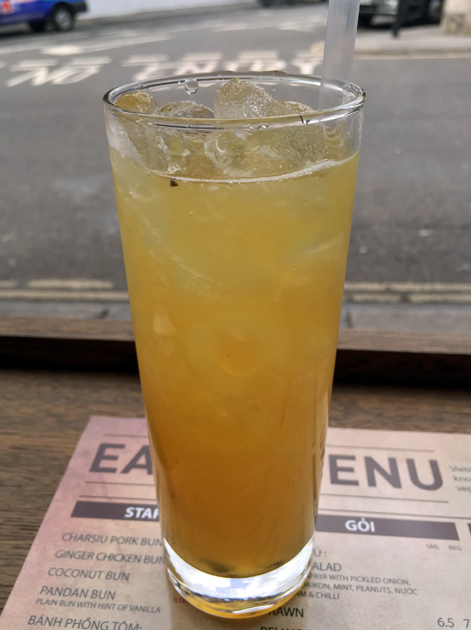 Located on Kingsland Road, Hoxton’s epicentre for Vietnamese restaurants, Bun Cha isn’t related (as far as I know) to the Exmouth Market cafe of the same name. It’s also, as far as I can tell, the only Vietnamese restaurant on Kingsland Road serving banh mi beside the local branch of Aobaba. Although the baguettes used here weren’t quite as airy and fluffy as the very best I’ve tried, they were still pleasingly crispy and warm too. Fresh coriander, punchy chillies and vinegar-ish pickled vegetables made repeat appearances. 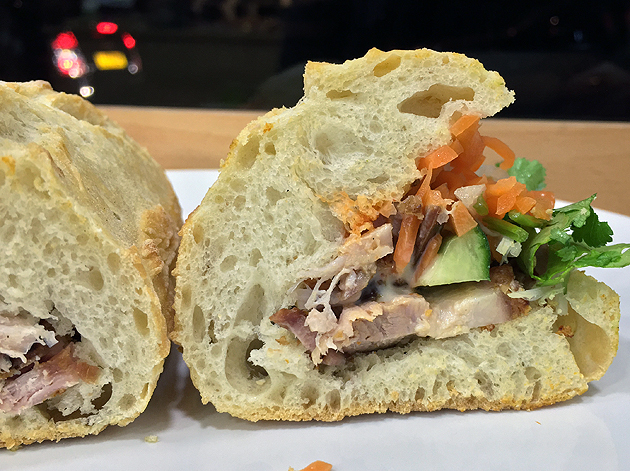 Mackerel doesn’t turn up often in banh mi. The fish used here had a salty taste reminiscent of shrimp paste. The chicken variant was a surprise – whole chunks of firm, smoky meat with a gentle nutty sweetness that was enhanced, rather than overwhelmed by the heat of the chilli slices. 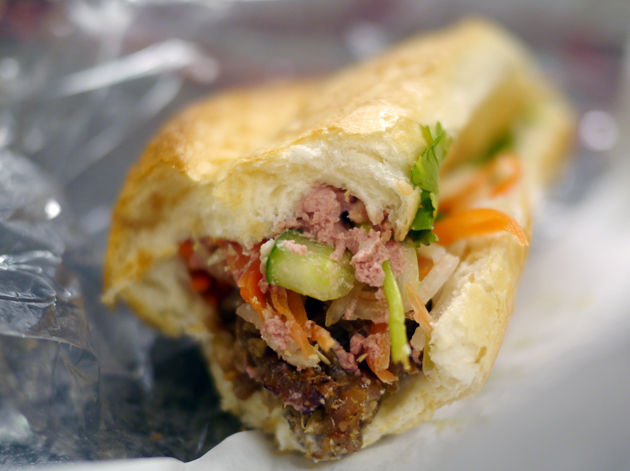 Interestingly, Bun Cha doesn’t have a version of the ‘classic’ banh mi with pork roll and pate. There are two alternate pork sandwiches instead. The first has pork grilled to a state of smoky tenderness and then served in a thin, yet tangy and sticky sauce. The second uses pork patties which were meaty and herby, despite being a little crumbly and surprisingly light. The soft and squidgy tofu variant failed to leave much of an impression. Aside from the transient texture of the tofu itself, it had more of a curry-like flavour than the advertised peanut and hoisin sauce. The beef was only slightly more impressive. The charred cow had mild hints of lemongrass and smoke which were complimented by the tartness of the pickled vegetables, but there was very little of the beef to be had. 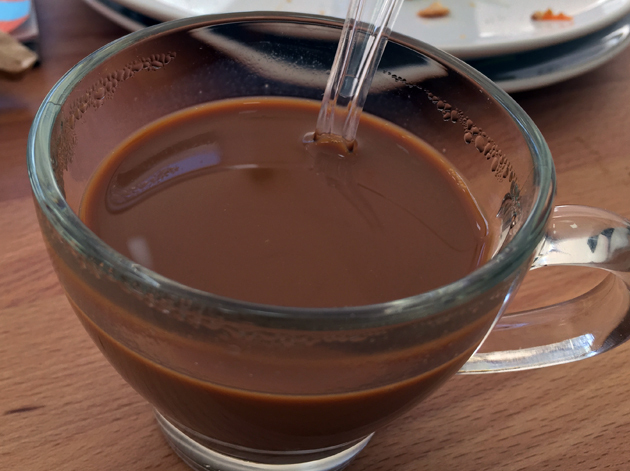 Surprisingly, there were some noticeable differences between the hot and iced Vietnamese coffees. The hot version was creamy, nutty and mildly bitter. 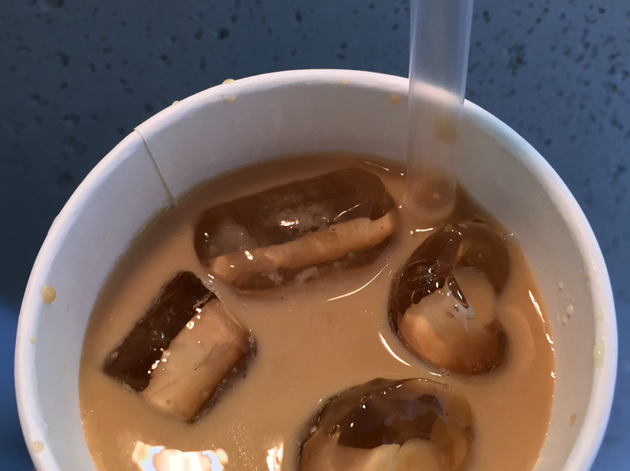 The iced version was a little sweeter, but the bitterness was stronger to the point of unpleasant astringency and was more watery too – and this wasn’t due to any melted ice. Bun Cha’s banh mi are rather hit and miss, but at least they’ve got the basics right giving them a solid basis on which to improve upon. Caphe Pho was one of the restaurants covered in my original banh mi group test under the name of Caphe House, but has since moved from a quiet side street in Bermondsey to a quiet side street near Smithfield meat market. Its new premises are much larger and more stylish, frequently filled with hungry office workers, although it’s unsurprisingly closed on weekends given its location. Sadly, despite the passage of time and change of location, Caphe Pho’s sandwiches haven’t changed that much. 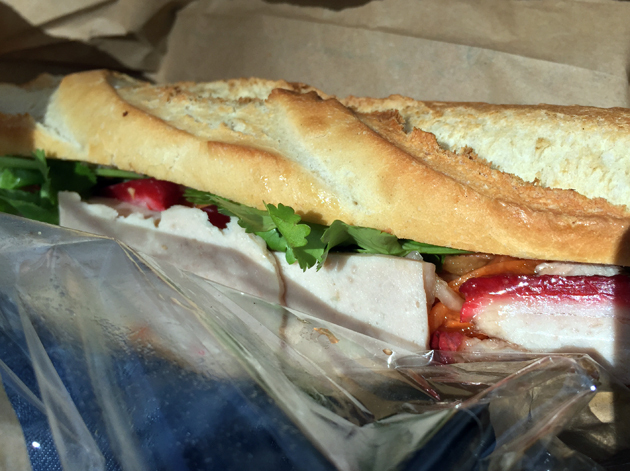 They still use plain, somewhat stodgy and heavy wheat flour baguettes, but at least the massive side salads have been pared back to a more manageable size. The baguettes are also buttered, which is unique amongst all the banh mi purveyors here as far as I can tell, while the pickled carrots and daikon used weren’t quite tart enough. 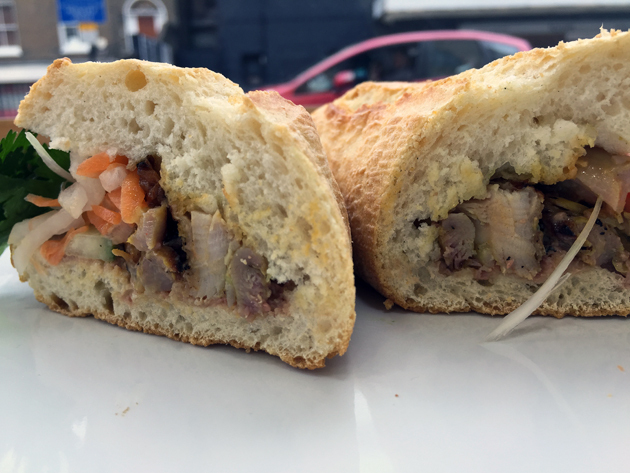 The pate, roast pork and pork roll banh mi was dominated by a surprisingly generous helping of smooth, earthy and musky pate. Although there wasn’t enough pork roll, the fatty streaks of roast pork hit the spot and were neatly complimented by punchy slices of chilli. 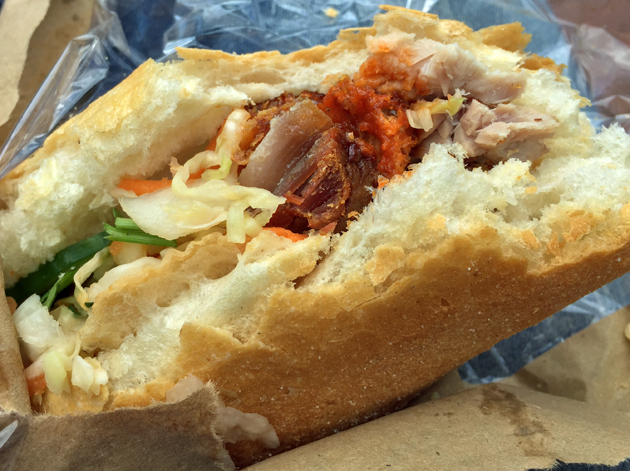 A more sedate dosage of pork came in the pork ‘skewers’ banh mi. The sweetly caramelised, occasionally fatty slivers of pork were by no means bad, but were tame in comparison to the bolder pork trio combo above. 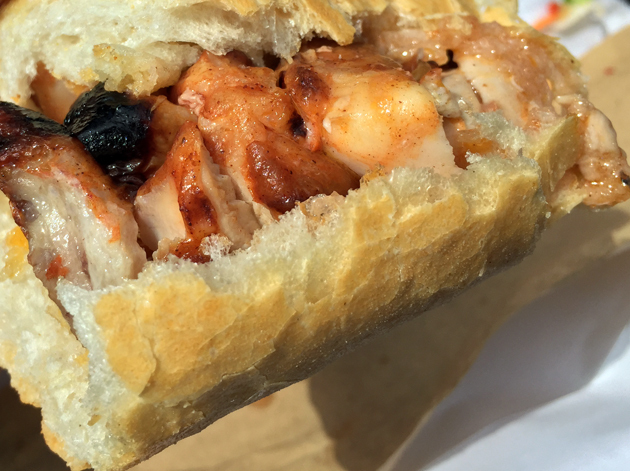 The chargrilled prawns-filled baguette turned out to be an unexpected double act with some uninspired room-temperature prawns livened up by a salty, tangy pate that tasted much like preserved shrimp paste. It’s an interesting and clever way of getting around some dreary Pret-level qualities of seafood – so much so, I’d rather have a larger helping of the pate instead of the prawns themselves. 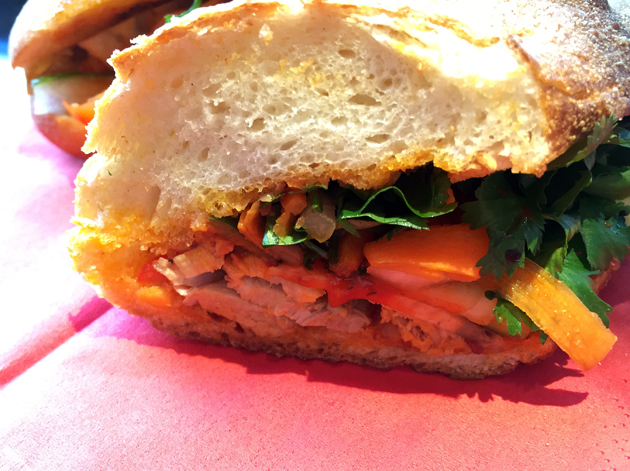 The poultry banh mi used firm chunks of roast chicken which were more like Cantonese soy sauce chicken in their nuttiness. It’s therefore a shame that the chicken was just so dry. 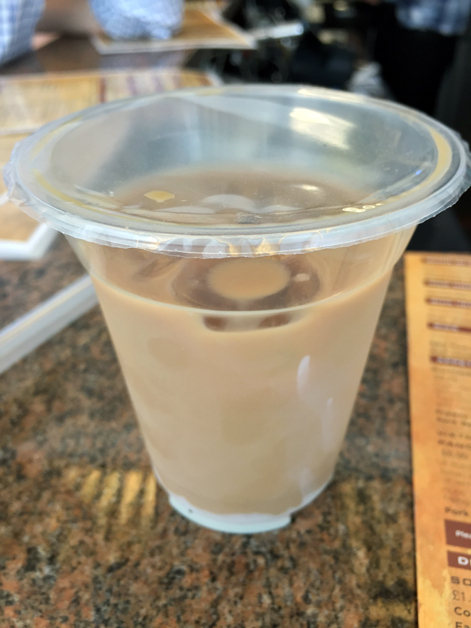 Across all of my visits, Caphe Pho’s iced coffee consisted mostly of condensed milk. 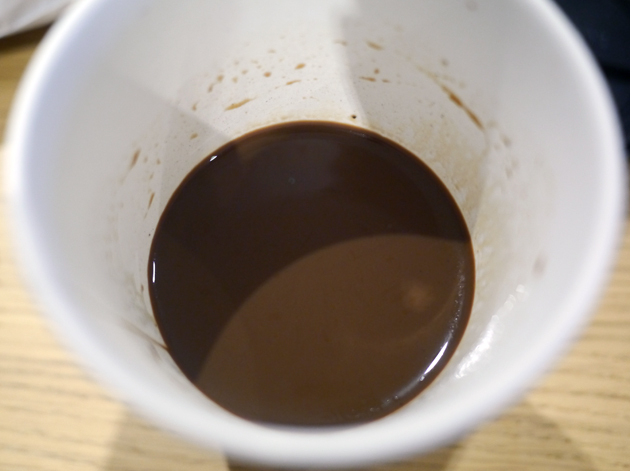 Although this didn’t make for a well-balanced brew, the creamy chocolate-ishness was nonetheless enjoyable enough. 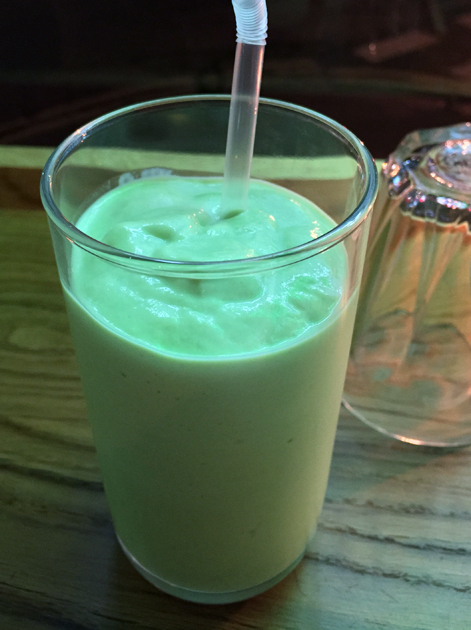 The avocado milkshake was cool and surprisingly refreshing given its viscosity, but the taste of avocado was very mild at best. The sour, sweet, lightly gritty tamarind juice turned out to be a better bet. 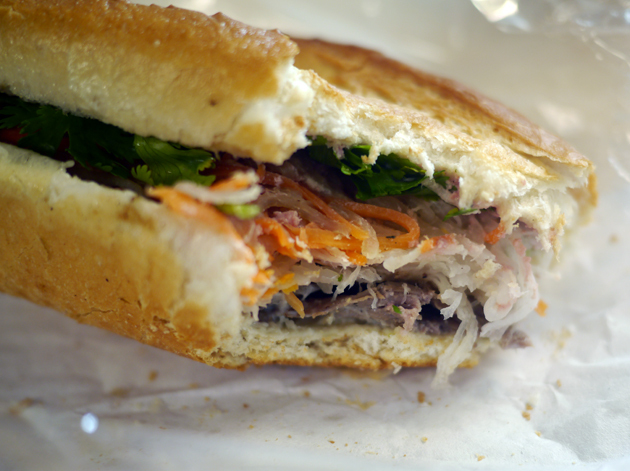 Caphe Pho’s banh mi aren’t bad, but they’re hardly exemplary either. 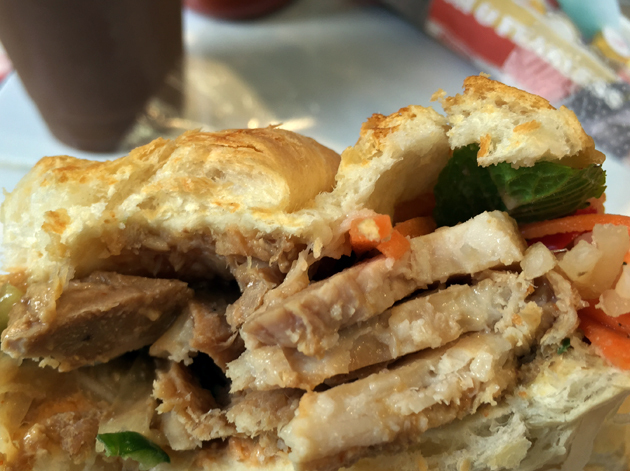 It’s a shame the banh mi haven’t moved on much with some half-decent fillings let down by so-so bread and other fillings that are clearly treading water. It’s not bad if you’re in the area and in a rush, but that’s faint praise indeed. There are a handful of seats at this Kentish Town deli, but it’s mostly a take-away affair. That didn’t stop the staff from being helpful, friendly, articulate and informative – sadly something of a rarity for Vietnamese eateries in this city. Despite opting for extra chicken pate, there was very little in evidence in the House Special. The lemongrass-tinged beef and chicken were far more noticeable than the bland, inoffensive pork, but the enjoyment of these two meaty elements was tempered by the tame accompaniments. The pickled vegetables were only mildly tart, while the limp coriander had seen better days. Even more problematic was the bread – initially crisp and crunchy, it ended up being such a stodgy, hard-going grind that I feared for the health of my teeth. The same problematic bread and vegetables were a recurring theme across all of my repeat visits to Carrots and Daikon. A lot of the fillings were imperfect too, needing more punch or finesse. The lemongrass chicken variant was filled with reasonably tender and moist shreds and chunks of poultry, but the modest taste of lemongrass was disappointingly transient this time around. 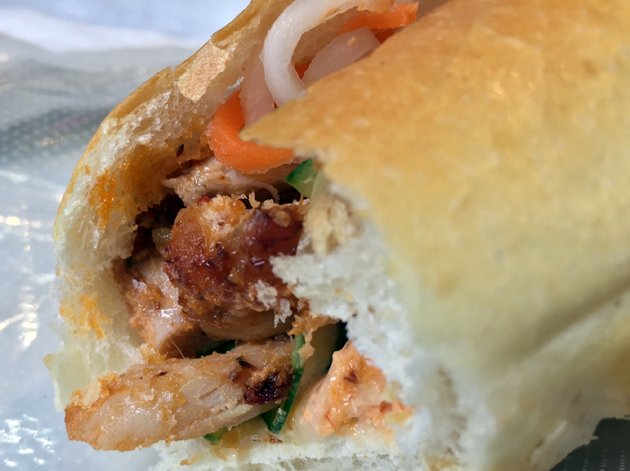 There was noticeably more chicken pate in this banh mi than there was in the House Special, but its mild meaty earthiness was over as soon as it began. The honey caramelised pork was only a little better. Although sweet, tender and moist, a little more smoke and salt would’ve gone a long way – especially as the pate made only a very fleeting appearance. The sesame garlic tofu was better. Not only were the bean curd pieces pleasingly springy in texture, their tartness was emphasised by the pickled daikon and carrots. 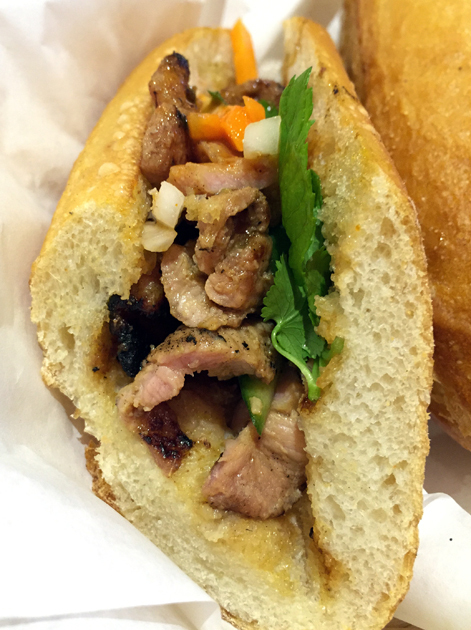 There are a couple of banh mi that are only available at dinner time. 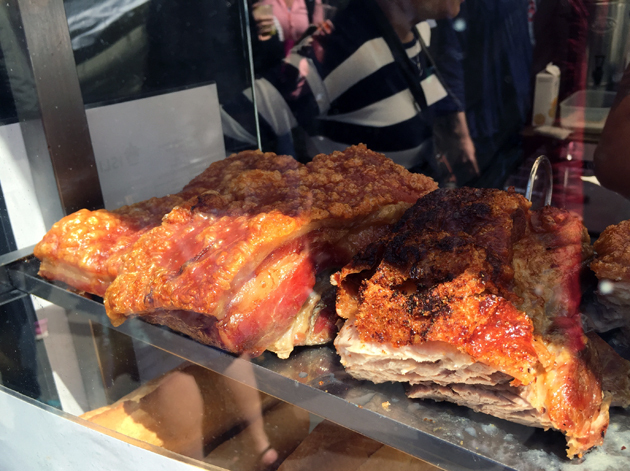 The ‘crispy’ pork belly was more like crunchy crackling and didn’t have quite as much fat as I would’ve liked, but it was still moist and suitably porky. It’s therefore a shame the stodgy bread got in the way of appreciating the swine flesh. The whole thing is served at room temperature, which might be a problem if you’re a pedantic old fart that insists everything has to be piping hot. More problematic was the tame sriracha mayo which was neither very spicy or particularly creamy. 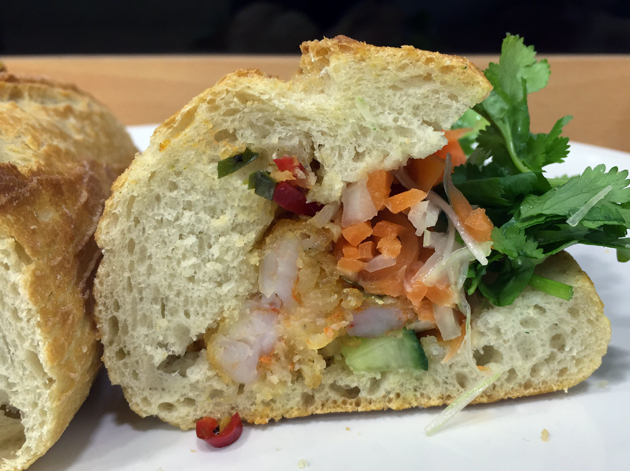 The second dinner banh mi is filled with chilli salted prawns. The so-so crustaceans were covered in a reasonably crispy batter. It was light too with vague hints of ginger and kaffir lime, although that might have been my imagination. The sriracha mayo once again wasn’t up to much and the thick bread got in the way. The lemongrass beef filling had a bigger citrusy punch than the lemongrass chicken, but this faded quickly. The beef was still nonetheless tender, with no stringy or gristly bits. The BBQ pork was tender and moist with a gentle honey sweetness and is easily good enough to rival the best that Chinatown has to offer. Surprisingly, the carrots, cucumber and daikon in these two last sandwiches was noticeably crisper and tarter that Carrots and Daikon’s previous efforts. The baguettes were crisper and lighter too, although they still weren’t as airy and light as the very best rice flour baguettes here. 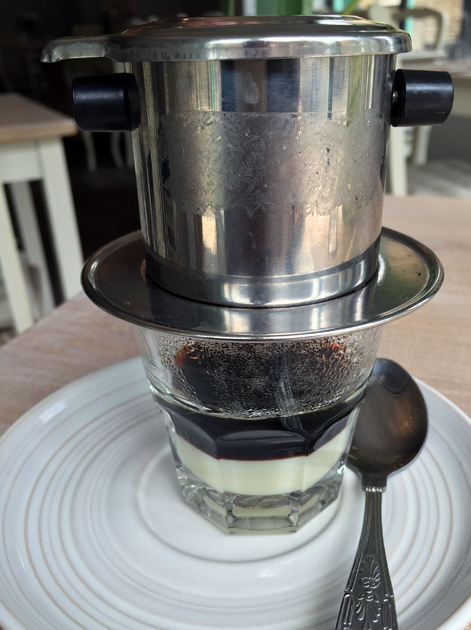 Interestingly, you can specify the amount of condensed milk in your Vietnamese coffee thereby altering its sweetness. 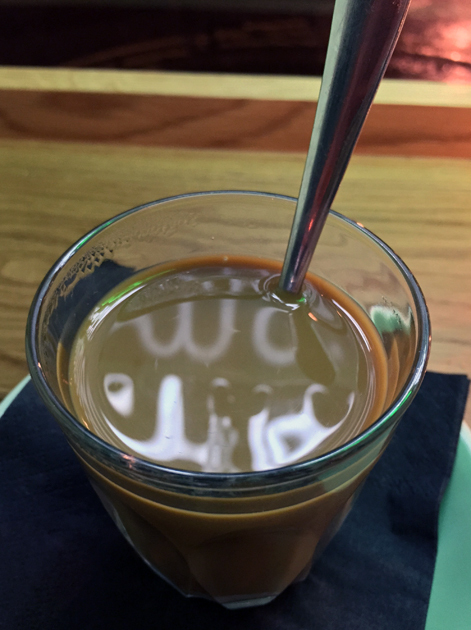 The ‘Low’ option means barely any milk is added at all, but this merely highlights the unimpressive brew on offer – very watery and slightly bitter. ‘Medium’ adds only a little more milk, where as ‘Strong’ lets it run riot taking over the drink which is probably just as well. A far better coffee, surprisingly, was the gimmicky sounding matcha latte. 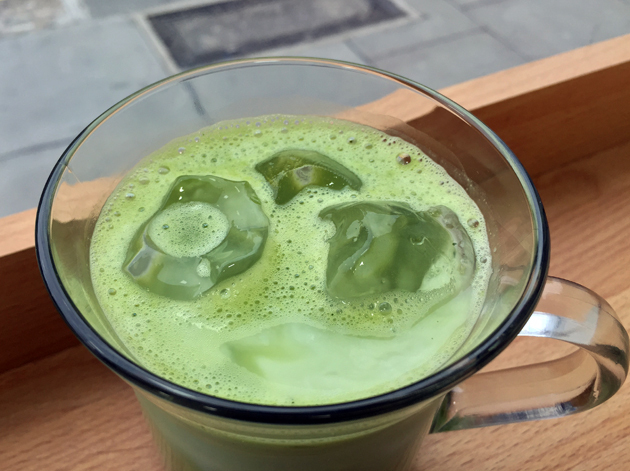 This iced brew combined the creaminess of a milky coffee with the distinctive taste of matcha green tea. 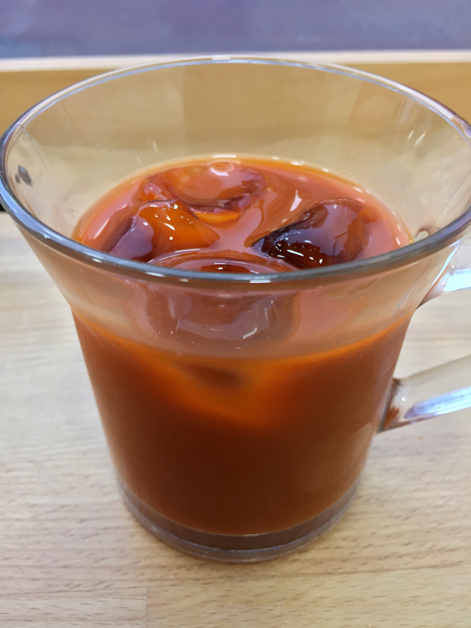 My favourite drink here, though, has to be the Thai red iced tea. 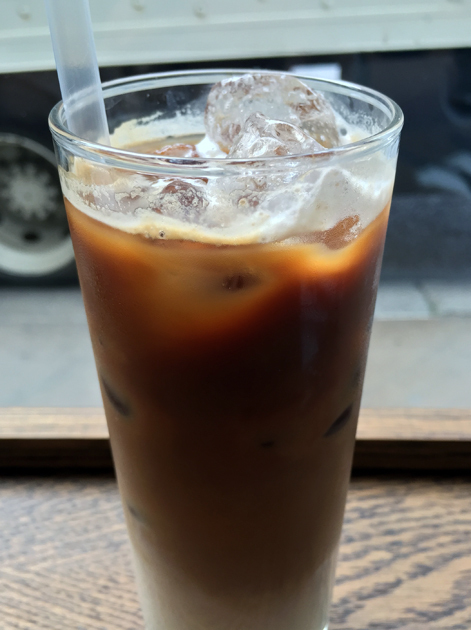 Smooth with hints of cream and caramel and an Ovaltine-ish sweetness, it’s very addictive and is easily one of my favourite non-alcoholic drinks in London. 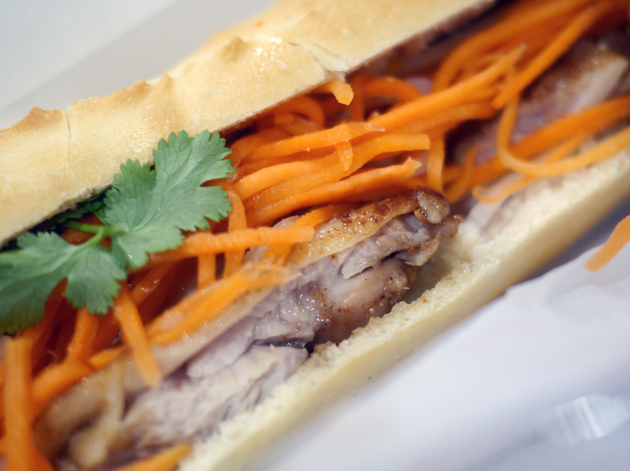 The banh mi at Carrots and Daikon need a lot more finesse, from the quality of the bread to many of the fillings. 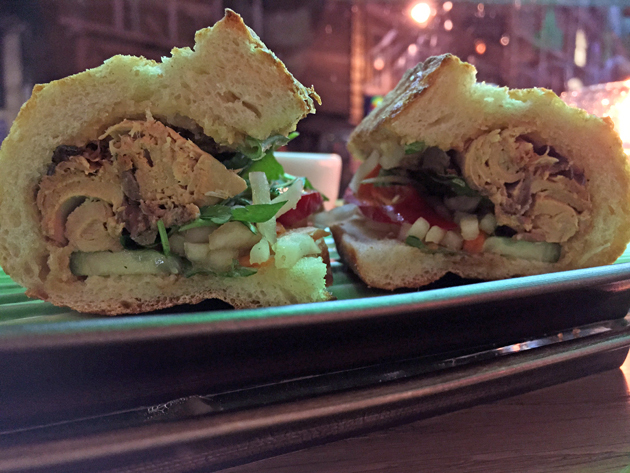 Many of the sandwiches are still enjoyable nonetheless and they have a good base from which to improve. All this, plus the friendly service, leads to a cautiously optimistic Three Star rating. Pho Viet 68, formerly the oddly-named Cyclo, is located just a short jaunt from Shoreditch High Street Overground station, although bear in mind that it only serves banh mi on weekdays. All of the sandwiches use quality baguettes – crisp, light and airy if a touch on the small side. 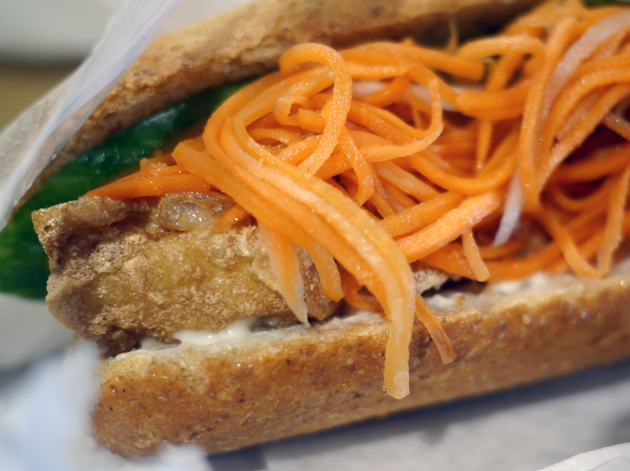 Sadly, the advertised catfish banh mi is rarely, if ever, available. The pork version uses slices of fatty, earthy and lightly sweet swine flesh that were still reassuringly meaty despite being thinly sliced. The pickled vegetables were a little muted, leaving it to the sriracha sauce and the punchy slices of dried, lightly fermented chilli to provide a flavoursome kick. I was pleasantly surprised by the chicken variant. The so-so chunks of breasts meat were livened up no end by a chilli sauce with a surprising depth of flavour ranging from salty to tangy alongside the more traditional piquancy. The pickled vegetables weren’t any better, but the addition of fresh coriander helped hide their deficiencies. 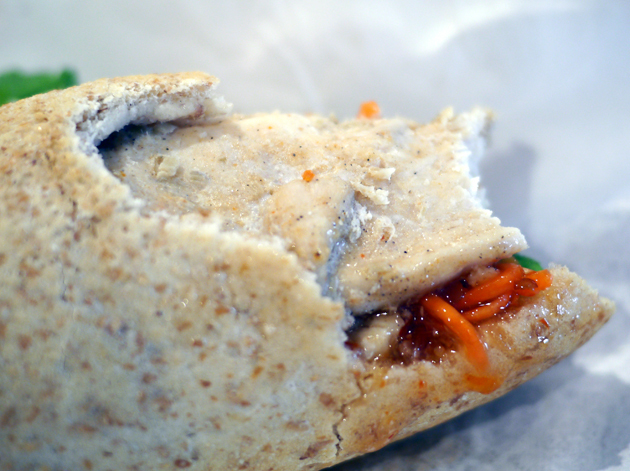 The tofu variant had a surprisingly creamy egg-like quality, emphasised by the thin folds of the bean curd. It was also a little tart, although this was largely obscured by the spicy sauce which packed a surprising amount of wallop. 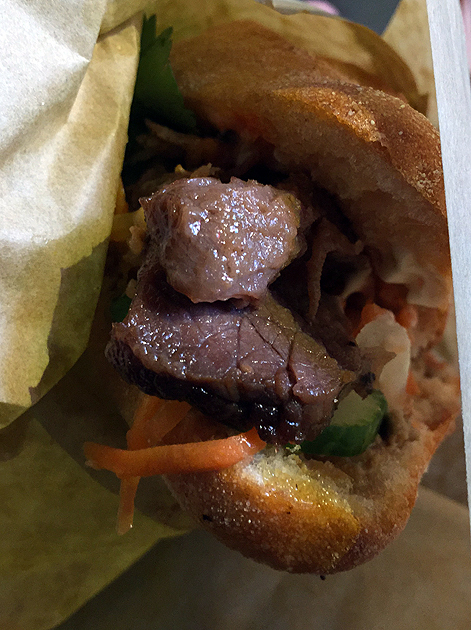 The least successful of Pho Viet 68’s banh mi had to be the beef. Although the beef had a hint of smoke and lemongrass to it, it was far too chewy and gristly to be enjoyable. Pho Viet 68’s hot Vietnamese coffee appeared to be overloaded with condensed milk across all of my visits, whether hot or cold. 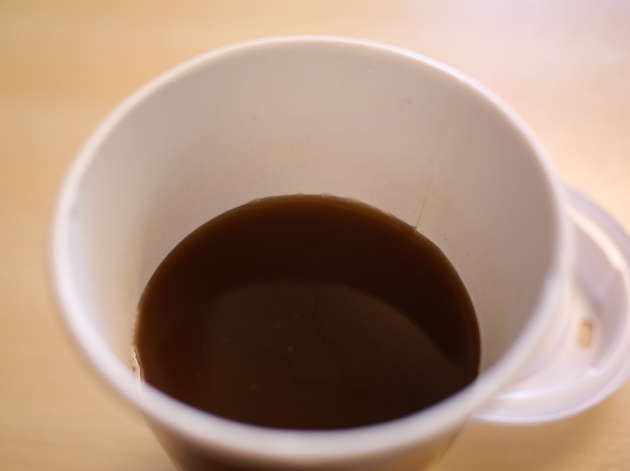 The brew tended to be caramel-ish and mildly creamy with only a very mild taste of coffee present. 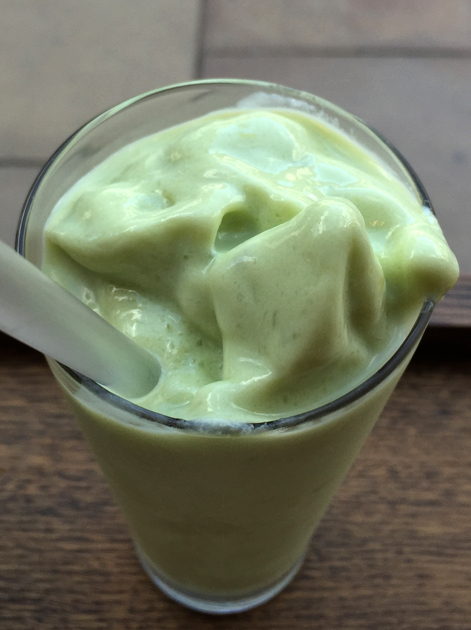 The avocado smoothie was a better, if less caffeinated alternative. Creamy, lightly sweet and sharp and refreshing too. 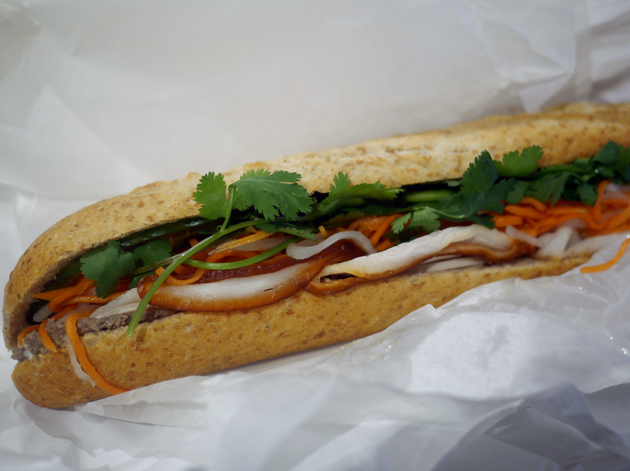 Pho Viet 68’s banh mi are by no means perfect, but they’re still among the better ones I’ve had in London. Skip the beef version though. 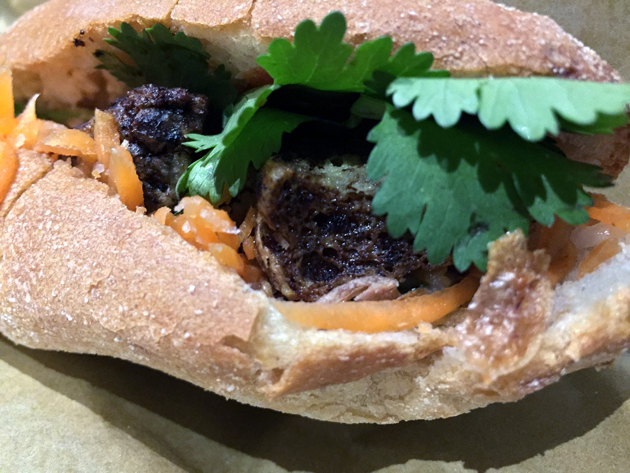 I was underwhelmed by my original visit to this misguidedly pan-Asian restaurant just off Oxford Street, so I held out little hope for a good quality banh mi from its new lunch-only take-out counter. The shredded pork option is the one most commonly available and I was pleasantly surprised by both the amount and the overall quality of the pork filling – milky pork roll and musky, salty pate. The shreds of grilled pork let the side down with its bland limpness, but that wasn’t the biggest problem with this sandwich. First, there was the lack of any vegetables besides the admittedly crisp spring onions and fiery red chillies. Second, and most damningly, was the cold, stodgy, hard bread. 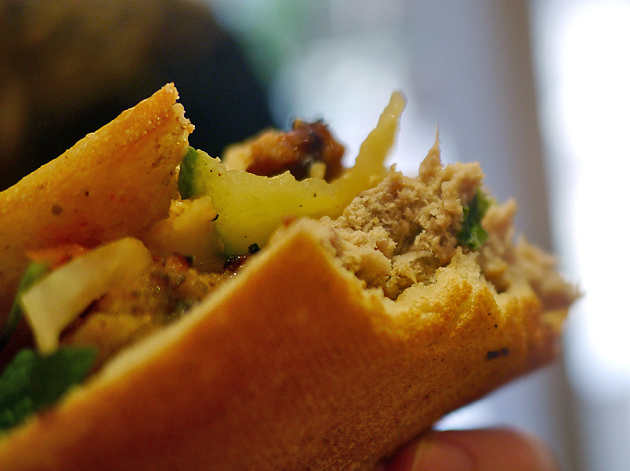 The surprisingly good pork filling merely highlights how bad the rest of this sandwich is. Good start, East Street, but you need to try harder. Hop isn’t related to the similarly named Hop Namo which once operated out of the Boxpark in Shoreditch. This lunchtime-only City joint has bright and colourful premises with standing space as well as seating. 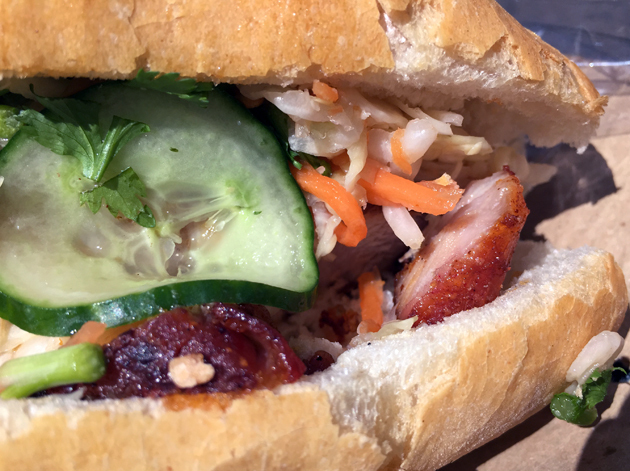 Unlike all of the other eateries and restaurants here, Hop’s banh mi aren’t prepared fresh to order – you instead grab the one you want from the chiller cabinet. Preparing a huge mass of sandwiches in advance is probably the only sensible way to to serve hordes of hungry City drones, but the detrimental effect it has on quality was obvious. 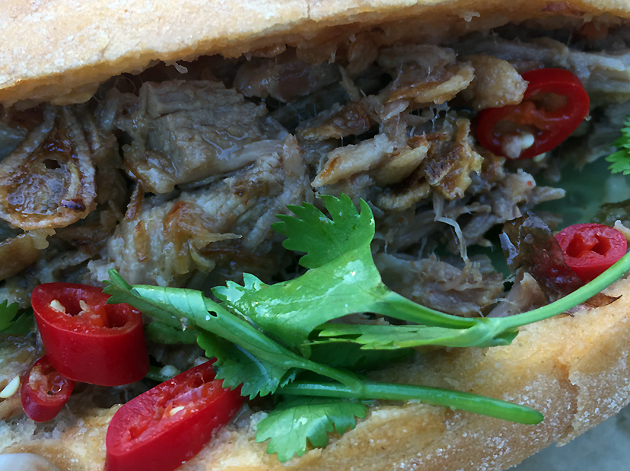 The bread used in all the banh mi were surprisingly light and airy, while plenty of fresh, zingy herbs were used from coriander to mint and Thai basil. But the fillings were dismal. The mushy pulverised ‘caramel’ pork was greyer than a cloudy winter’s day and would’ve tasted of nothing at all if it wasn’t for the lightly spiced mayo. The spring onion omelette variant was flat and lifeless. The chilli chicken was better, with small chunks of chook in a sticky, lightly sweet and moreish sauce. But it was spicy only in the same way that I’m the Pope. And I’m not even Catholic. 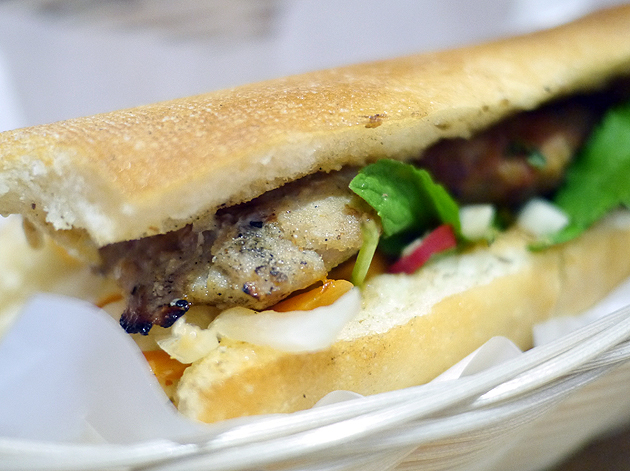 The pork belly and pate banh mi was a double disappointment. Although the slices of pig were somewhat meaty and salty, the severe lack of fat meant a corresponding lack of flavour – something which the bone chilling temperature didn’t help. The weak pate was only occasionally creamy, at best. 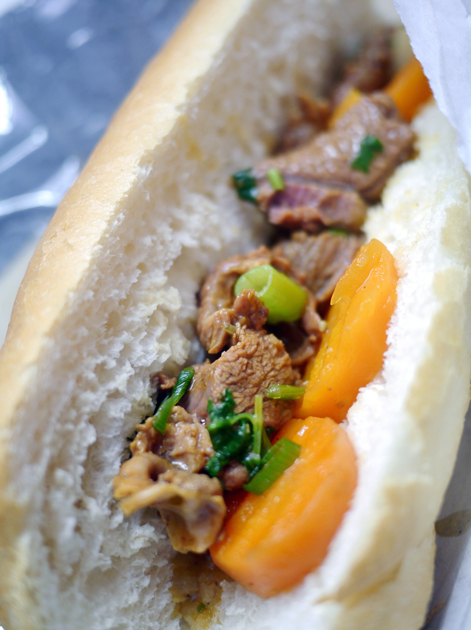 One of the least offensive of all the banh mi was the version filled with lemongrass beef. Although hardly remarkable, the beef was at least tender with occasional hits of lemongrass zestiness. 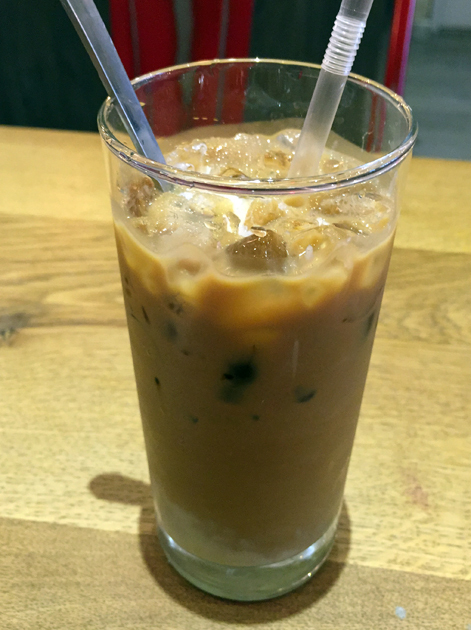 Hop’s iced Vietnamese coffee was bitter and mildly chocolatey, but also a little too weak and watery for my liking. 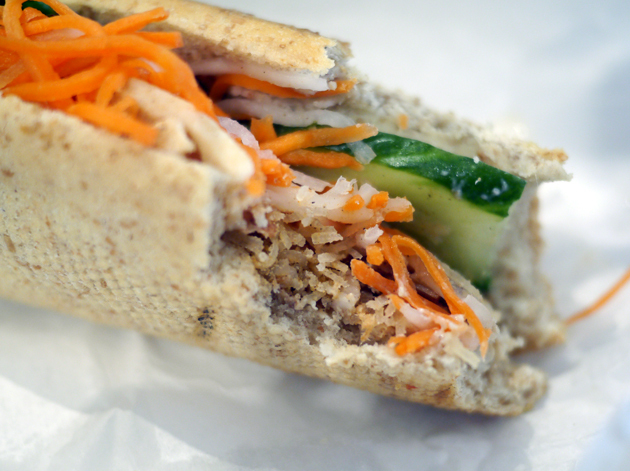 The quality of the herbs used to garnish Hop’s banh mi can’t disguise the generally abysmal quality of the fillings. The nearby Banh Mi Bicycle is somewhat better, but hardly exemplary either and, as a street food stall, lacks Hop’s seating. 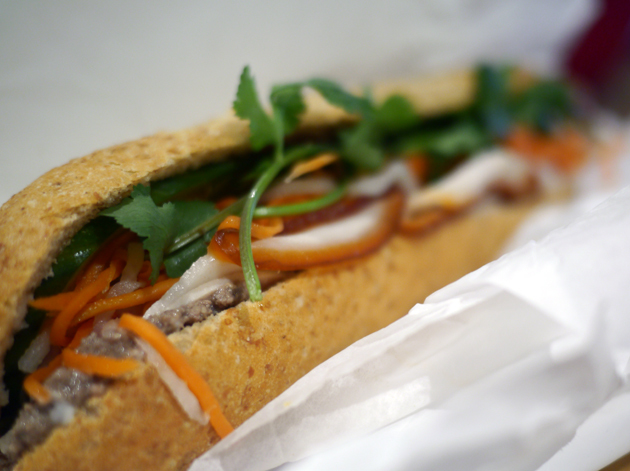 The City really deserves more banh mi that are as good as those available from Bep Haus. Perhaps, in time, it’ll get them. I had some rather lukewarm experiences at House of Ho when it first opened, but some things have changed at this Soho restaurant (and not just my abandonment of rhetorical questions). 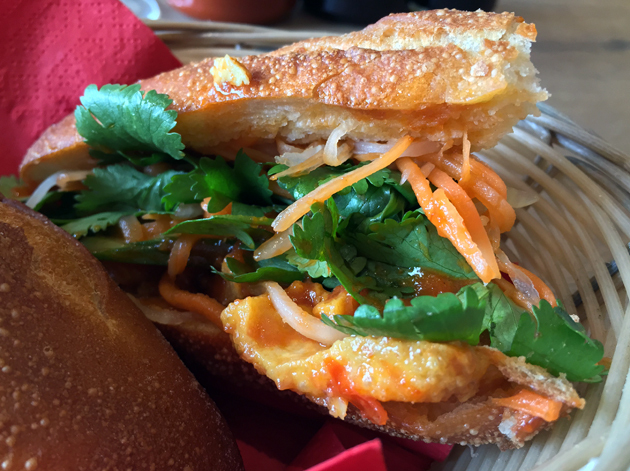 It now serves some traditional Vietnamese dishes, such as pho and banh mi, in addition to it more inventive, modern fare – albeit only at lunchtime. 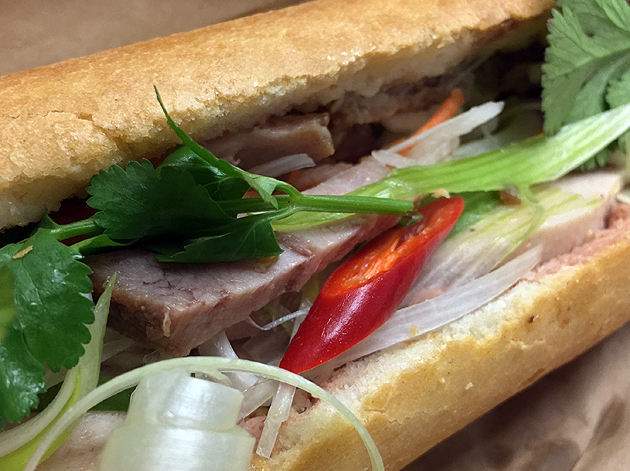 The banh mi are at least available for takeaway. 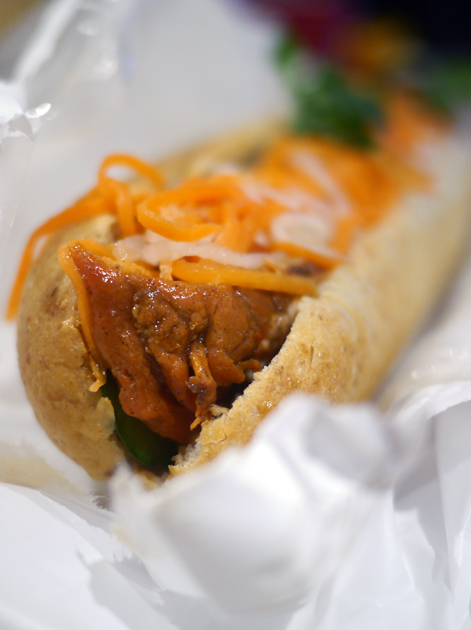 Even so, I wasn’t expecting much which made the high quality of some of the banh mi all the more surprising. I was immediately enamoured with the zucchini-like texture of the gently tenderised chayote and its mildly sweet melon-like taste. 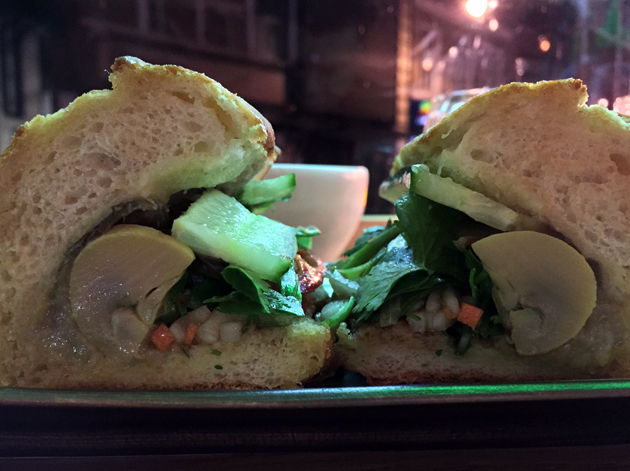 The tasteful, accomplished use of this Mexican vegetable in a Vietnamese sandwich might seem incongruous, but it fit right in and puts many Mexican restaurants to shame. Although the pickled vegetables and mayo were nothing to write home about, the bread was a different matter. 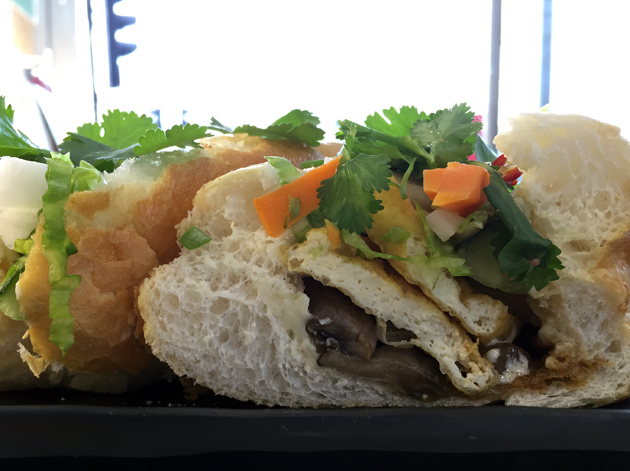 Exceedingly crisp, fluffy soft and airy – it’s the best example of a rice flour baguette that I’ve seen so far. 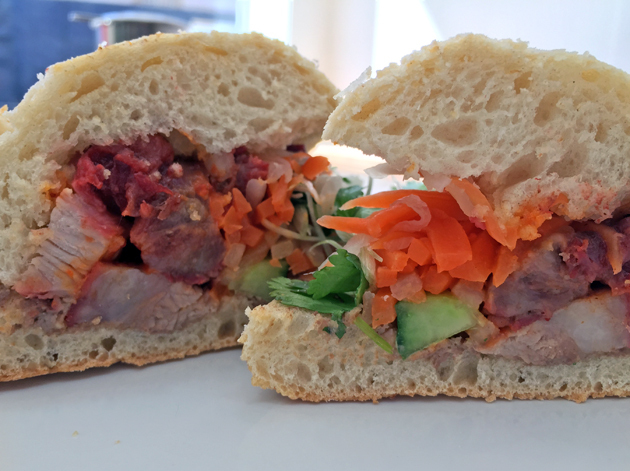 The same superb bread and lacklustre pickled veg were used for the pork shoulder banh mi. The swine flesh was exceptional – very tender and unctuously fatty strands of meat were made even better by the mayo. The latter’s lacklustre creaminess proved to be an asset here – emphasising the lusciousness of the pork without overwhelming it. If my review of House of Ho’s banh mi ended here then it would romp home with Five Stars, but there’s a reason why I revisit restaurants. Subsequent visits revealed a sharp drop in the quality of the baguettes, with the bread devolving to a soft, saggy, chewy state. Although it didn’t require too much jaw action, it was still a very disappointing regression. This disappointment was compounded by the filling of the duck banh mi. The tender, mildly earthy meat also had a moderately fruity plum-like taste to it, but both aspects faded quickly leaving it to the spicy chilli slices to pick up the slack. 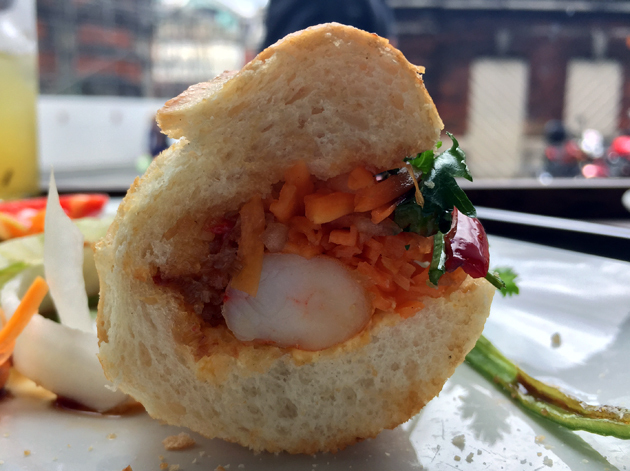 The seafood banh mi used the same droopy bread as the duck variant, but the filling of catfish, prawns and squid was much better. The texture of all the seafoods struck just the right balance between a firm bite and a tender consistency, while the tame mayo daubed all around took on a prawn cocktail-style marie rose quality. House of Ho’s takeaway banh mi were marketed, at least briefly, under the unfortunate name of ‘Ho to Go’ which does at least befit its Soho location. 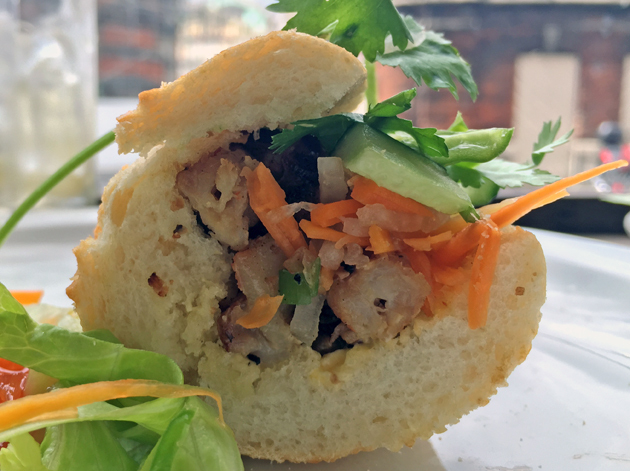 In any case, the takeaway banh mi signalled a return to form for the bread which was once again delightfully crisp and fluffy. 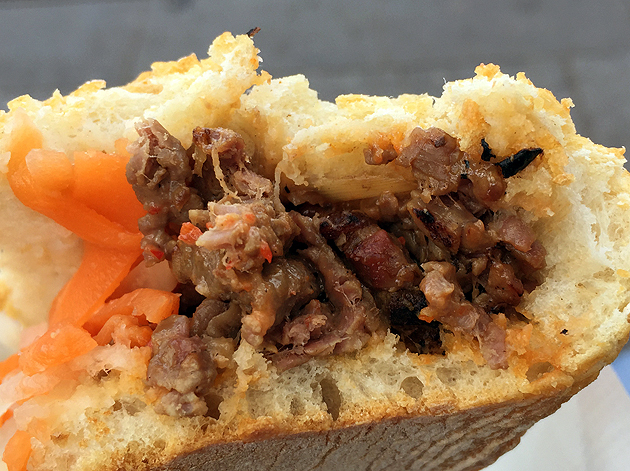 The swine flesh used in the pork banh mi wasn’t quite as tender and unctuous as it was before, but it was still pleasing soft and fatty plus the carrots were tarter too. The takeaway vegetable banh mi used aubergine instead of chayote, but it was at least tender, smoky, mildly buttery eggplant. 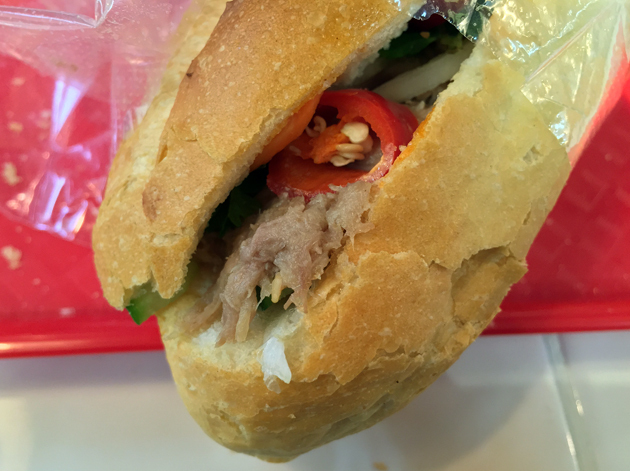 The wobbles in the quality of both the bread and the fillings used in House of Ho’s banh mi is worrying and deprives it of a clean sweep Five Star rating. 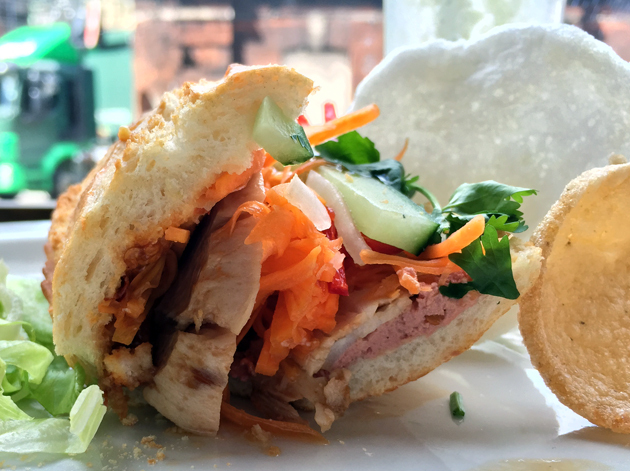 Even when it droops and sags though, House of Ho’s Vietnamese sandwiches still put many of its competitors in the shade. The original Shoreditch branch of Keu was one of the winners of my 2014 banh mi round-up, so I had high hopes for its new Soho off-shoot. Disappointingly though, the sandwiches here aren’t carbon copies of the originals. They’re smaller and less generously filled, perhaps as a result of the higher overheads of a West End operation. Still, despite their smaller size, the baguettes were always crisp, light and airy in my experience. The dominant taste in the Keu Classic was of the earthy and musky pate. This was a surprise as most other eateries skimp when it comes this meaty component. The downside was that the other meaty elements were barely a presence – there was very little pork belly or terrine and only occasional hints of the sweet caramelish pork floss. 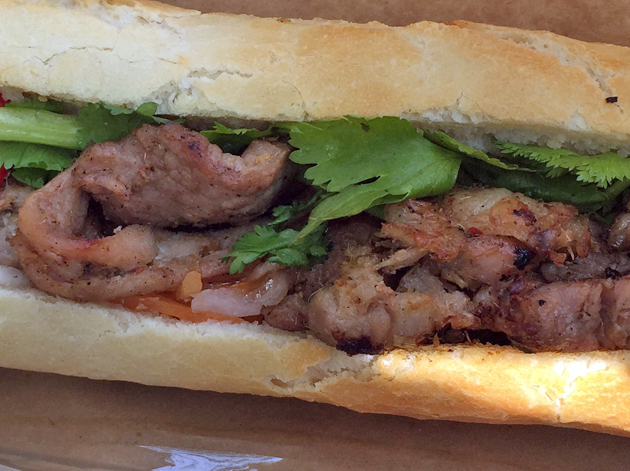 There was thankfully plenty of pork belly in the eponymous roasted pork belly sandwich, or Bánh Mì Heo Quay. The swine flesh took the form of pancetta-like cubes – fatty and meaty with occasional crisp, unctuous bits of crackling. The richness of the pork was counterbalanced nicely by the crisp and very tart pickled vegetables. 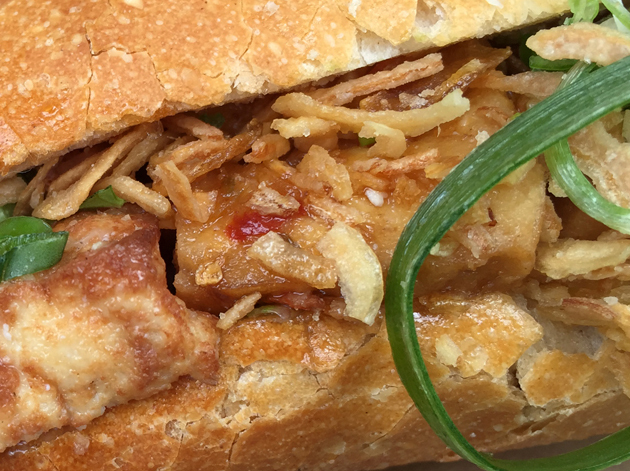 Eggplant fans will be disappointed to discover that the skinless chunks of fleshy aubergine in the aubergine banh mi were outnumbered by the soft, squidgy tofu pieces and forgettable mushroom halves. Another problem was the scallion oil tended to soak thru to the bread, causing it to become a tad too soggy and soft. A disappointing vegetarian option. 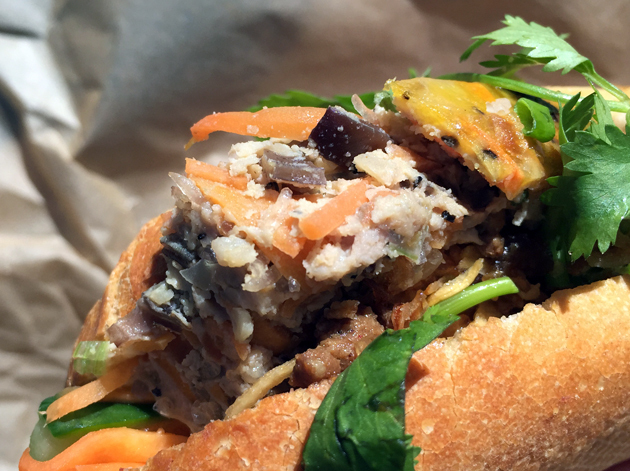 The mackerel banh mi was a competent if unremarkable affair. 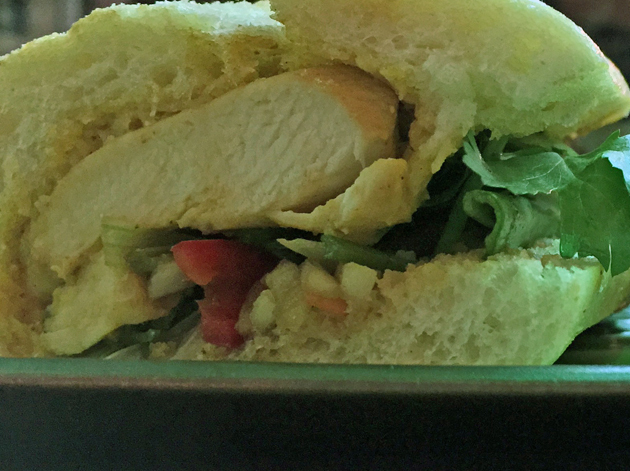 A little more interesting was the sandwich filled with curry chicken. There was no messy sauce drippage though – the dry rubbed poultry had a light floral-ish fragrance and a bean-like flavour to it, but this was all a little too subtle for its own good. The roast duck variant was more boldly flavoured – the meaty chunks were earthy, moist and reasonably fatty. 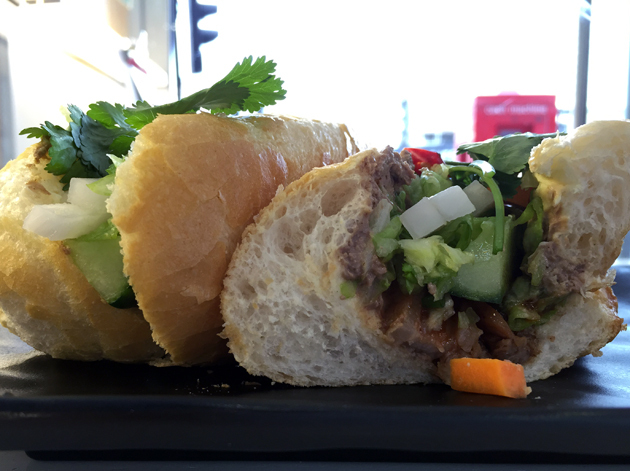 There wasn’t quite enough of the sweet lacquer-like skin and the portion size as a whole is at least a third smaller than the version available at the Shoreditch branch, but this was still a very enjoyable banh mi. The beef ball-filled sandwich wasn’t quite as successful, but the mildly coarse, heavily seasoned balls still hit the spot. It’s a slightly odd banh mi filling, but my only real regret here was that the hints of basil were very subtle indeed. A more conventional option would be the BBQ pork – the woody, lightly smoky and occasionally fatty slices of pork had occasional, subtle hints of lemongrass and five spice. 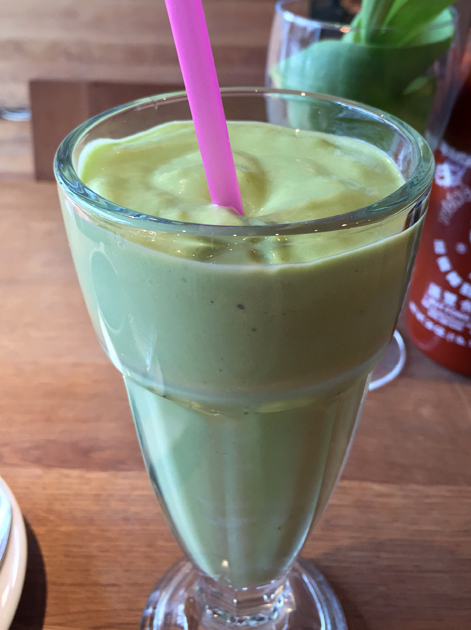 Although Keu’s avocado shake was thinner, less sweet and a touch more astringent than Ladudu‘s version, it still had the distinctive, pleasing taste of the fruit. 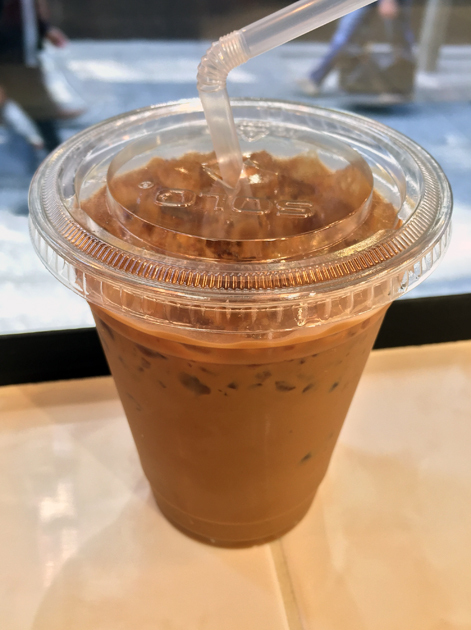 Whether iced or hot, the Vietnamese coffee was generally a winner too with a rounded bitterness that’s easy to appreciate given the modest levels of condensed milk. 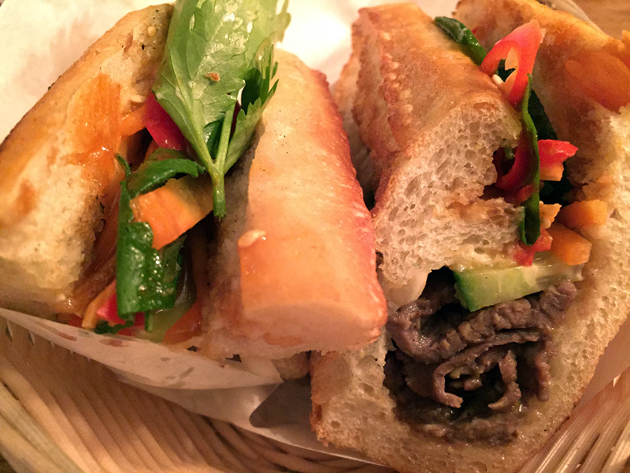 Although the banh mi at Keu Soho are among the most expensive in this round up and aren’t quite as barnstorming as the ones at the original Shoreditch restaurant, the Vietnamese sandwiches here are still easily among the best in London. Plus you can have them for dinner too. Leicester House occupies the same premises once filled by the dearly departed St John Hotel. 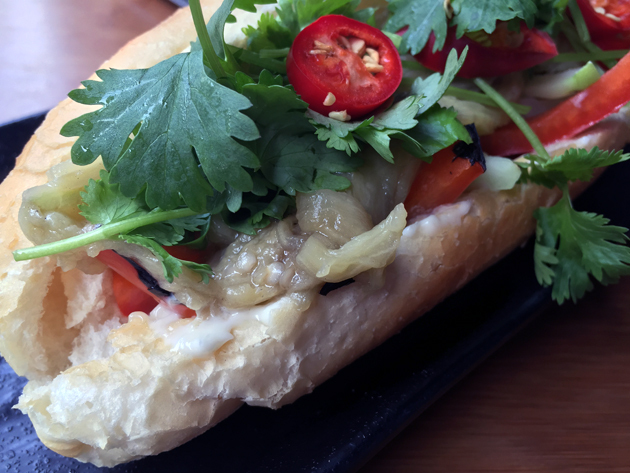 There’s only one banh mi available here, either at the small bar or at one of the comfy tables (despite what the online menus would lead you to believe). 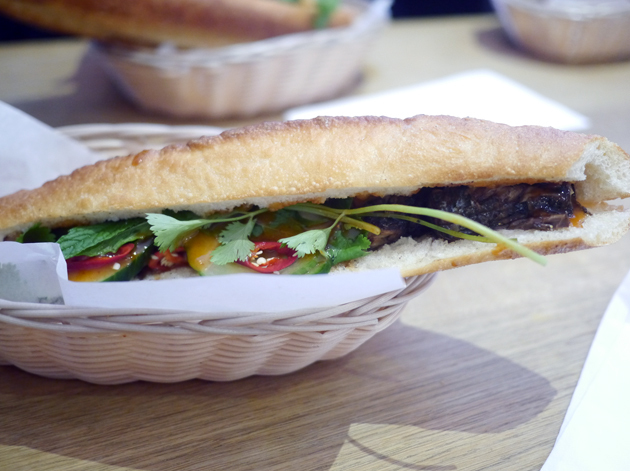 The banh mi here used a crisp, light and airy baguette, although it was a bit too chewy in places. The shreds of pork belly were tender, but bland and lacking in fatty unctuousness. The scanty duck pate was even less impressive. At least the mayo was creamy and the vinegary pickled vegetables had a tender, yielding texture. 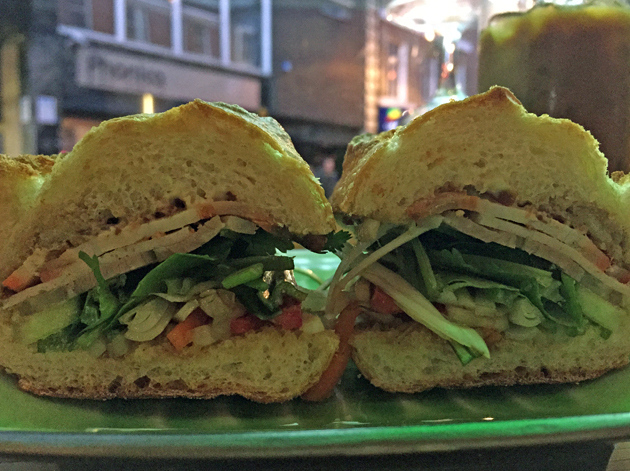 But with such lacklustre meat, this banh mi just can’t justify its £9 price, no matter how plush the surroundings or polished the service. 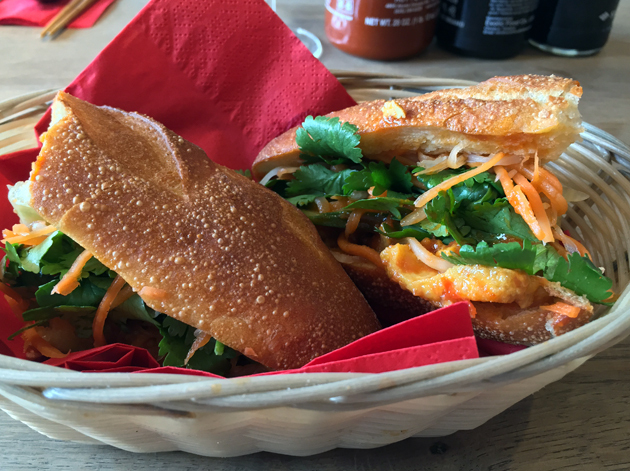 Little Viet Kitchen is located at the arse end of Islington’s Chapel Market. Its opening hours are somewhat convoluted, although this doesn’t really matter when it comes to banh mi since the Vietnamese sandwiches are only served at lunchtimes. Curiously, you get a significantly smaller sandwich if you opt to sit down rather than takeaway. In either case, the breads used were reasonably light and airy but also a little too crunchy with tough crusts. Interestingly, the more vegetable-focussed banh mi turned out to be more interesting and more satisfying the meat-oriented versions. 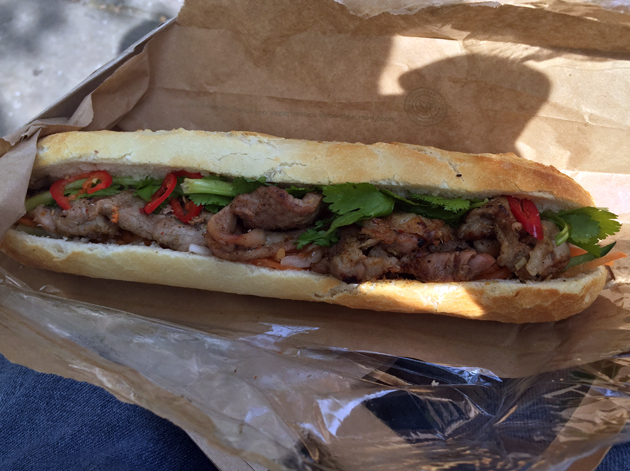 The pork belly banh mi was by no means bad though – the lightly sweet and salty porcine chunks were moist, complimented neatly by buttery mayo and spicy chilli slices. The pickled vegetables were reasonably tart too. It’s by no means bad, but it’s rather tame for a sandwich filled with what should be a powerfully flavoursome cut of pork. Small shreds of lemongrass chicken were fruity sweet with occasional zesty hits. Discounting the smaller sit-in size, this somewhat muted sandwich wasn’t as satisfying as the pork belly version above. Although there were only occasional hints of meatiness in the minced pork, carrot and water chestnut loaf, it was still pleasing. Although the loaf was quite loose and crumbly, making for a somewhat messy eat, its moist nuttiness was light yet satisfying. 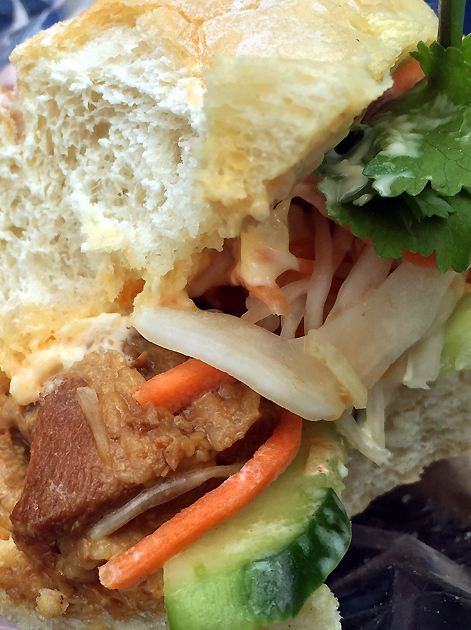 For a completely meat-free option, you could a lot worse than Little Viet Kitchen’s tofu banh mi. Despite being thinly sliced, the tofu was surprisingly meaty. It was covered in a tart, sticky sauce and accompanied by reasonably sharp vegetables. 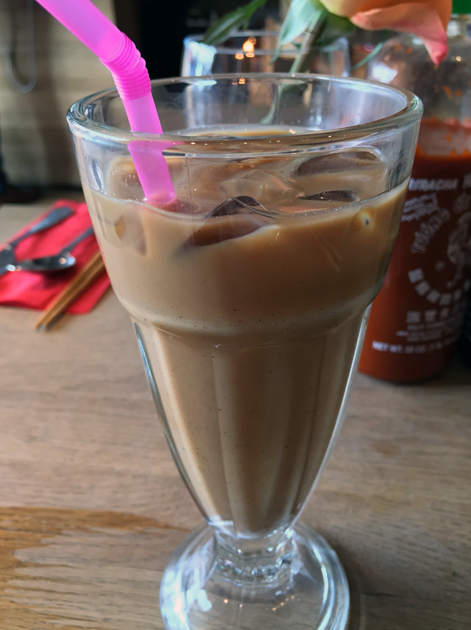 I never got the chance to try Little Viet Kitchen’s take on iced Vietnamese coffee, but the hot version turned out to be a winner. 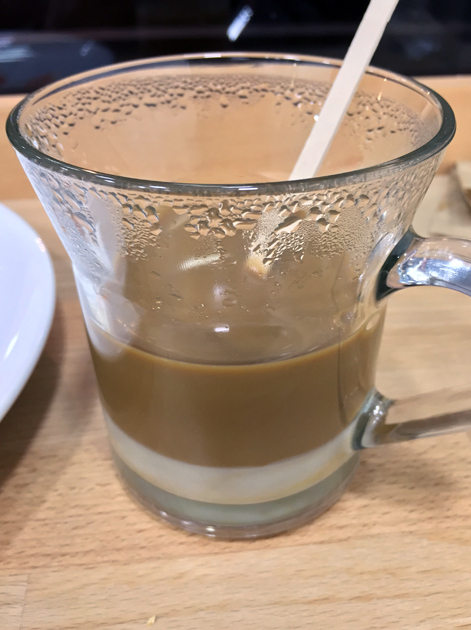 It had a relatively strong kick to it and a pleasingly rounded bitterness that wasn’t overwhelmed by the creamy sweetness of the condensed milk. 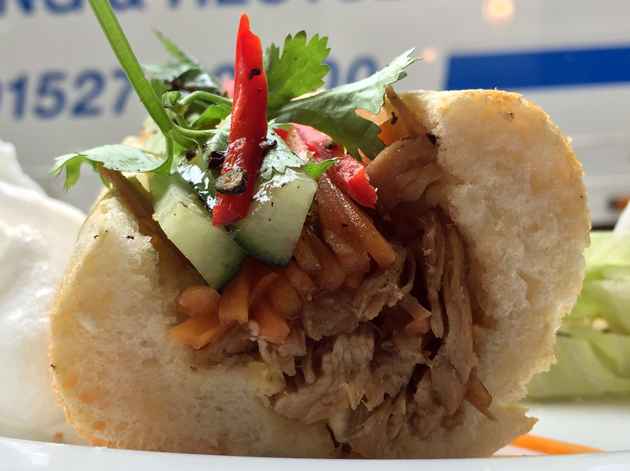 Little Viet Kitchen is off to a good start with its banh mi. 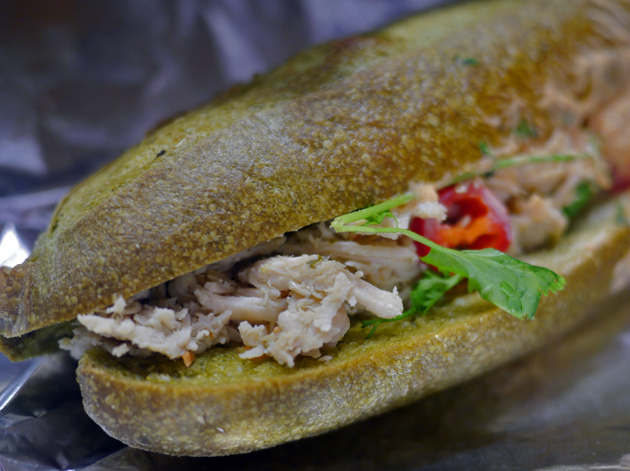 With a little more care and attention devoted to its bread and fillings, especially if they’re in the same vein as the water chestnut loaf, and it could become the standard bearer for banh mi in Islington. 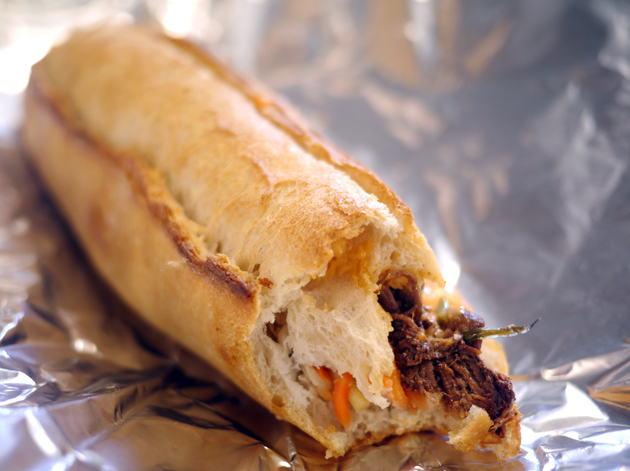 Although Moba uses the term ‘banh mi’ to describe its filled baguettes, they have very little in common with traditional Vietnamese sandwiches. I’m obviously not against innovation, but the usage of the term feels a little deceptive here – especially as many Londoners still aren’t familiar with the more traditional varieties. The biggest, most fundamental departure is the bread used. If these loaves use rice flour, then I’d be very surprised indeed – fluffy but also thick, crunchy and more than a little stodgy and chewy. They’re by no means bad, but they’re a significant departure from the norm. 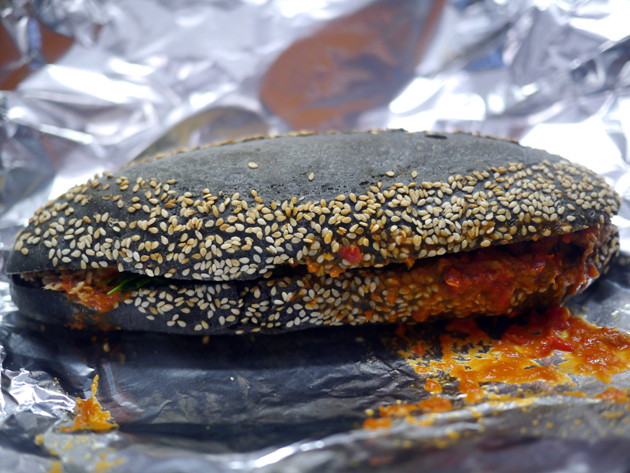 One very dubious innovation is the coloured breads, such as matcha green and sesame black. Although visually striking, the difference in taste was very modest with only vanishingly small hints of green tea and nuttiness respectively. Moba actually started out with a very different menu than the one it currently has at the time of writing. Its baguettes were originally filled with very non-traditional fillings such as gravlax, chicken tikka, curried prawns and butternut squash. 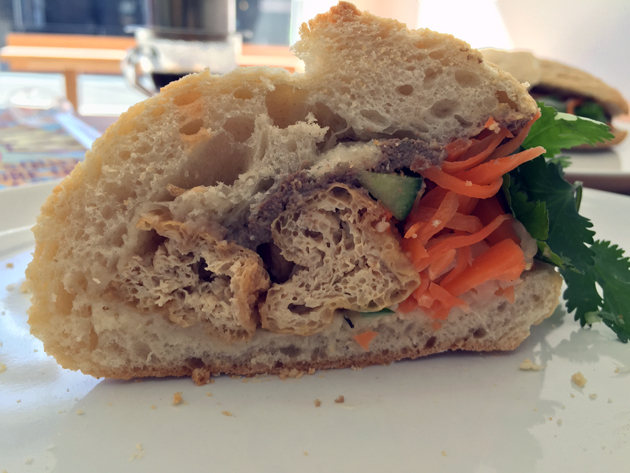 There’s nothing wrong with that in principle, but didn’t make for a very convincing banh mi when combined with the stodgy wheat flour bread. Its current ‘summer menu’ was only marginally more successful. The beef brisket filling was reasonably tender and unctuous, but overall quite unmemorable. It wasn’t helped by the recommended cilantro Sriracha mayo. 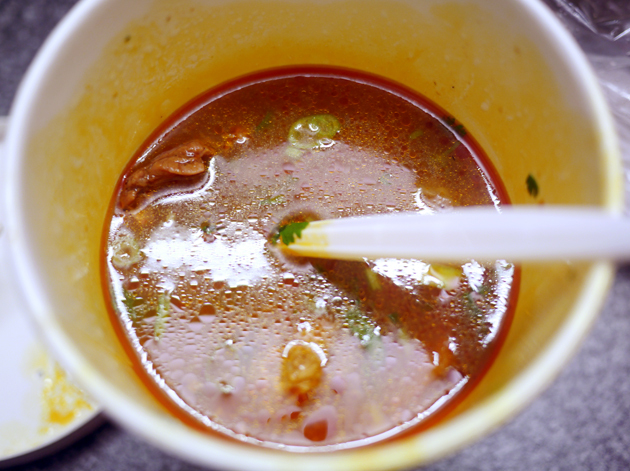 Although creamy, it was only transiently spicy and had very little taste of coriander. Predictably the pulled pork was an anonymous mush, although this did at least let the reasonably tart pickled vegetables take centre stage. The recommended caramelised chilli sauce was little better than supermarket salsa. Surprisingly, the best of all the meat options was the lemongrass chicken. 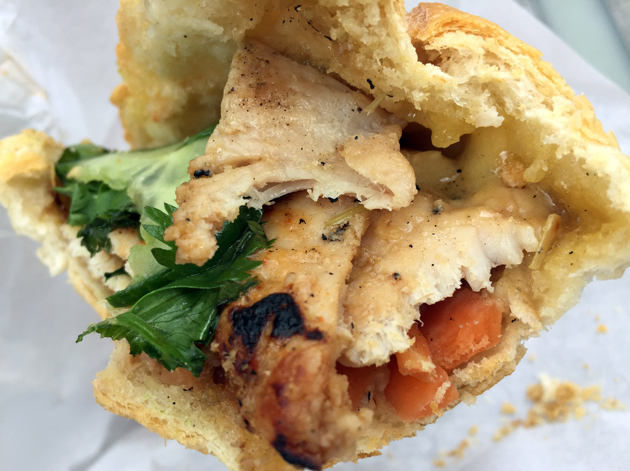 While the poultry was too shredded and bitty, it did at least have a strong taste of lemongrass that didn’t fade as I made my way through this sandwich. The taste of lemongrass was even bold enough to overwhelm the modest tartness of the pickled vegetables. The vegetarian option turned out to be more satisfying than any of the meat fillings. Tender chunks of sweet butternut squash and buttery zucchini were suitably flavoursome yet light. Once again, the caramelised chilli sauce was a damp squib. 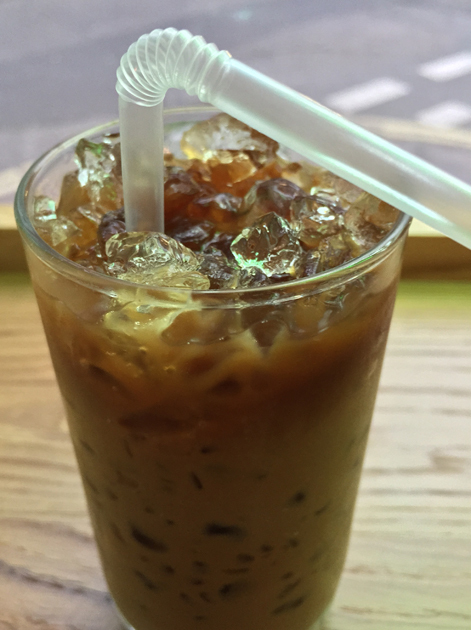 Moba’s iced Vietnamese coffees proved to be frustratingly inconsistent, ranging from watery with only a vague hint of sweetness to mildly fruity, but with the condensed milk not stirred in properly. Moba’s other professed speciality are its pastries. Its original attempts at croissants and brownies were only good as bin liner and its revised versions were only slightly better. 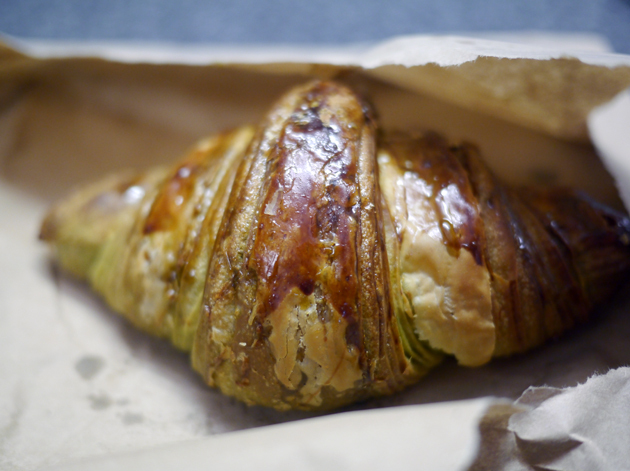 The matcha croissant had an oddly glazed exterior. It was reasonably light on the inside, but was still harder and staler than is acceptable. The matcha green tea flavour was very weak and it wasn’t even very buttery. 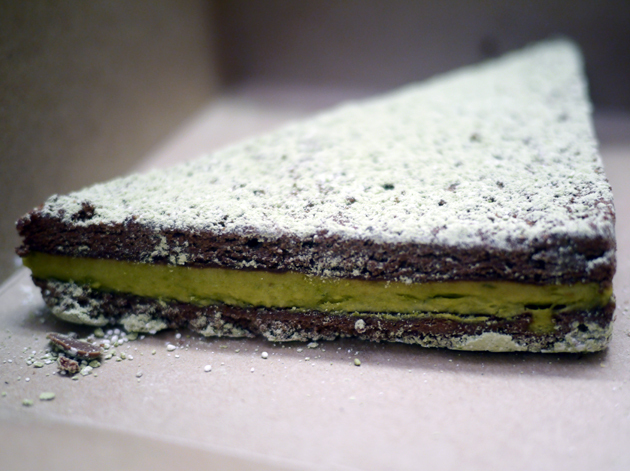 The matcha brownie had an odd triangular shape and sandwich-like construction with moderately flavoursome green tea cream in between two dry, crumbly, vaguely chocolatey cake slices. It’s not like any brownie I’ve had before, but it’s still better than the utterly atrocious abomination they originally opened with. 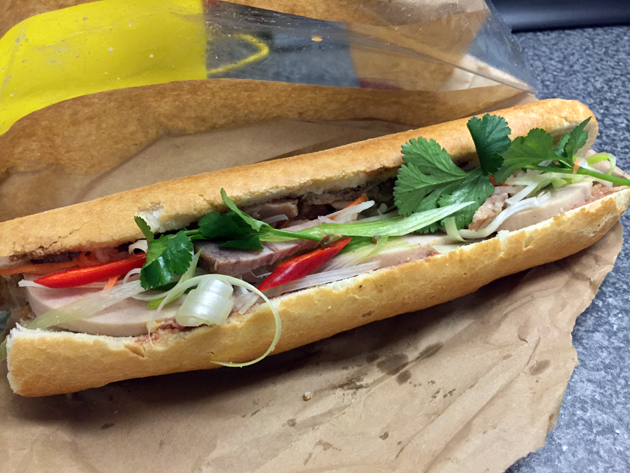 Moba’s filled baguettes are complete non-starters as banh mi – they bear so little relation to the Vietnamese template, I’m tempted to call in trading standards. They’re not bad as novel sandwiches in their own right, but they’re not quite good enough to justify their high prices. The less said about Moba’s generally diabolical pastries the better – these baked goods are a waste of calories and aren’t good enough to grace the skip behind a Patisserie Valerie, never mind your stomach. Located in one of the little-visited railway arches underneath Charing Cross station, it’s unlikely you’d come across MOC Kitchen unless you were deliberately looking for it. 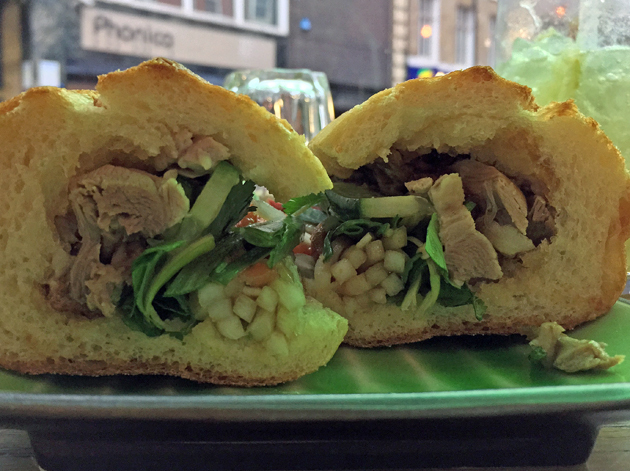 MOC Kitchen is actually split between two premises on opposing sides of the passageway – a sit down restaurant and a takeaway serving banh mi among other dishes. 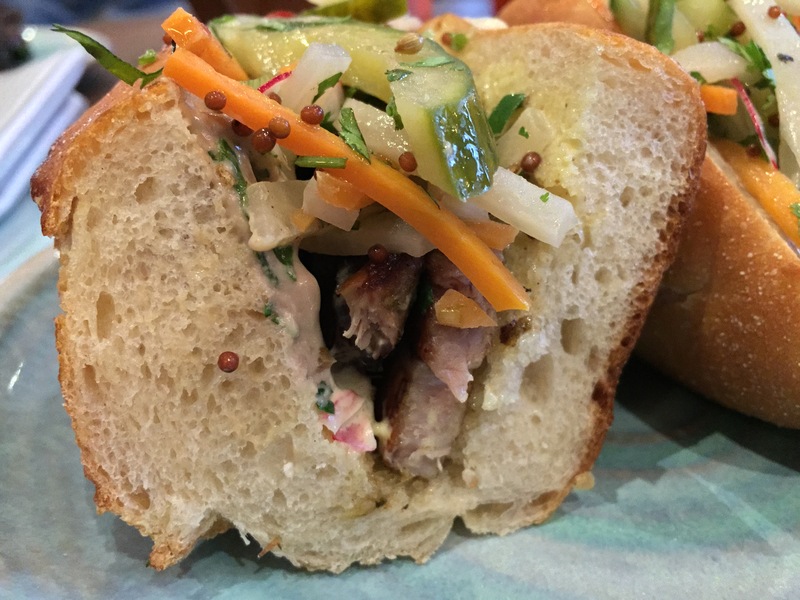 All three of MOC Kitchen’s banh mi use a sharp, tart selection of sliced cucumbers, daikon radish and carrots, although the liberal application of creamy, umami kewpie mayo makes them resemble coleslaw. Sadly, the bread, while reasonably crispy, is too chewy and heavy to be a proper light and airy rice flour baguette. Of the two pork fillings, the barbecued pork is the least successful. The slices of meat more closely resemble a grilled, lightly caramelised pork and is reasonably pleasing in its own right, but its modest flavour is easily drowned out by the creaminess of the mayo. The braised pork was much better. The unctuous, mildly fatty chunks of pork were bathed in a mildly garlicky sauce that didn’t clash with the mayo. The only non-vegetarian option is the tofu-filled variant. 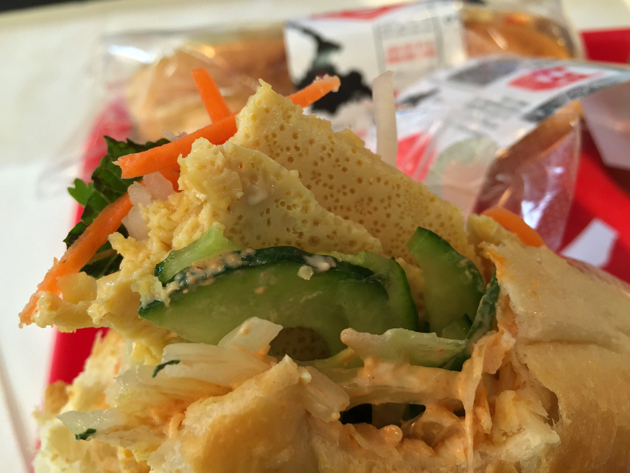 Although not as good as the tofu options from Pho Viet 68, Carrots and Daikon or Keu, the flat slices of tofu were still pleasing – largely thanks to their golden, bready, lightly malty coating. 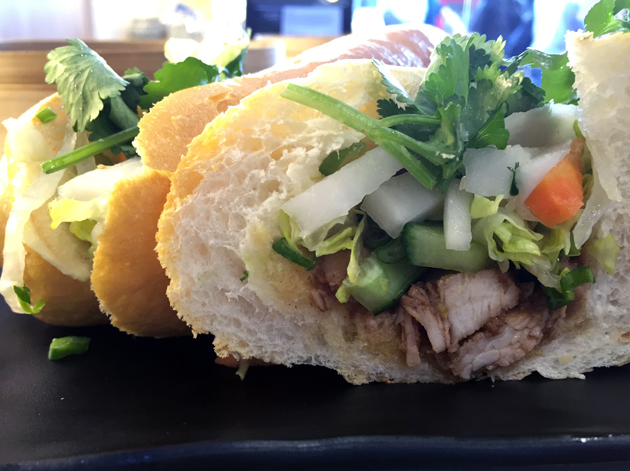 MOC Kitchen has the basis of some good banh mi with its quality fillings, but it needs better bread before it can really soar. Located on a side street in Clerkenwell, this lunchtime-only cafe has an eclectic clientèle of both new media professionals and manual labourers in high vis jackets. Sadly, the promised Vietnamese coffees weren’t available on any of my visits. Even worse, the baguettes used were very ordinary with none of the crisp lightness I’d expect from a rice flour loaf. 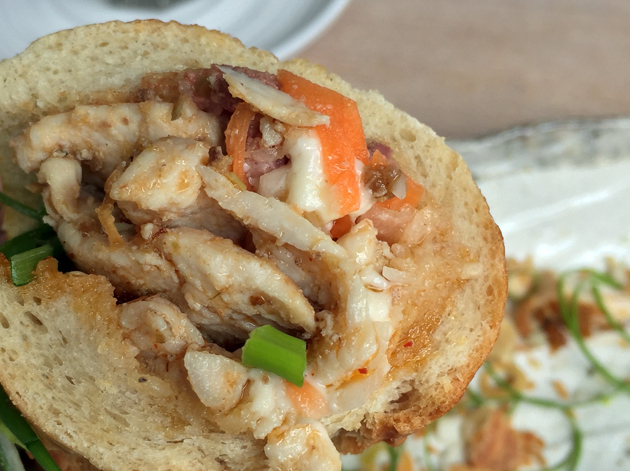 You can have any filling you want in your banh mi as long as it’s chicken or some version of pork. The only chicken option sees tender, freshly charred chunks of chook flavoured with a lick, but only a lick, of lemongrass. The slices of chilli were tame though, while the pickled carrots weren’t very pickled at all deriving most of their tartness from a thin tangy sauce instead. There was little of the promised pate in the Special, but there was plenty of salty pork roll and slightly sweet barbecued pork. It was a pleasing combination although it wasn’t helped by the ‘pickled’ carrots which were just as uninspiring as they were before. You could have the pork roll on its own, but devoid of any pate or indeed any other accompaniments besides the carrots, it quickly becomes a somewhat monotonous exercise for your jaw. The grilled pork alternative wasn’t much better – although peppery, the chunks of swine flesh were also a little too dry for my liking. 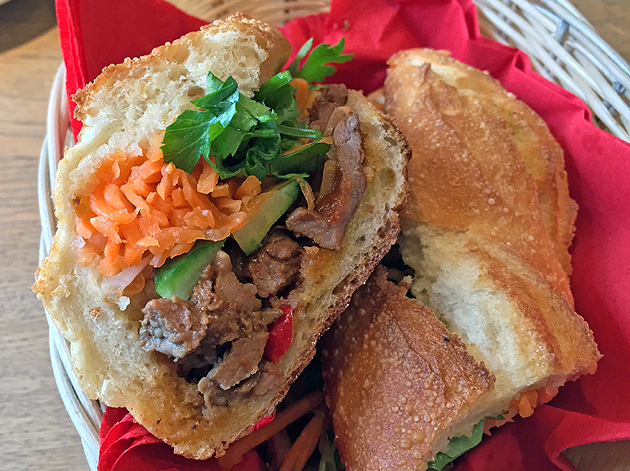 New Saigon Cafe’s banh mi feel like minimum-effort, by-the-numbers box-checking additions to an already crowded menu of other Vietnamese classics, rather than carefully considered and crafted creations in their own right. They’re not completely joyless, but you’d only eat here if you were in the neighbourhood. Oi Hanoi occupies the premises previously occupied by Miss Chu. I haven’t been able to find out if Oi Hanoi is a completely new operation run by different people or just a rebranding. In any case, the refreshed branding is a good thing – the scowling visage of Miss Chu’s founder that previously dominated the outside hoarding was about as welcoming as a blood-stained truncheon. Although there are now more tables, the smartphone chargers previously present at every table are gone. All of the banh mi used breads that were very light and airy, but also unnecessarily dressed with butter. 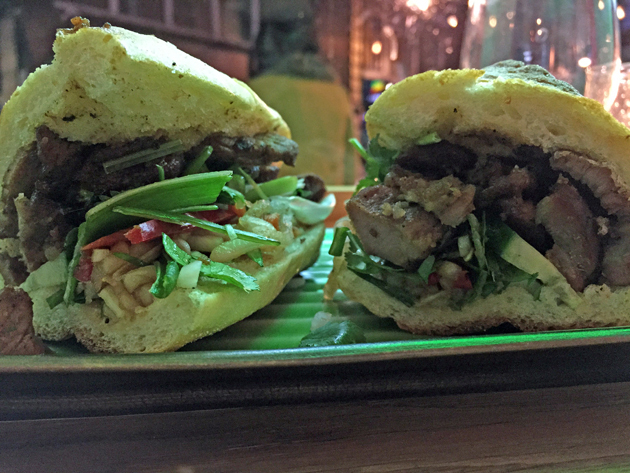 It was hard to appreciate either the pork belly or wild boar pate used in Oi Hanoi’s pig-themed banh mi as both were smothered underneath the plum sauce. This did at least have a vague umbeoshi-style tartness, rather than the usual sickly sweetness or treacly nature of the versions usually slathered on top of meat, making up for the limpness of the pickled vegetables. The chicken variant was mildly sweet and salty and bathed in a sticky, mildly moreish sauce. It wasn’t bad, but I ultimately preferred the less heavy vegetarian version. Light, bready and slightly malty tofu was paired with taut, slippery, salty and vinegary mushrooms. 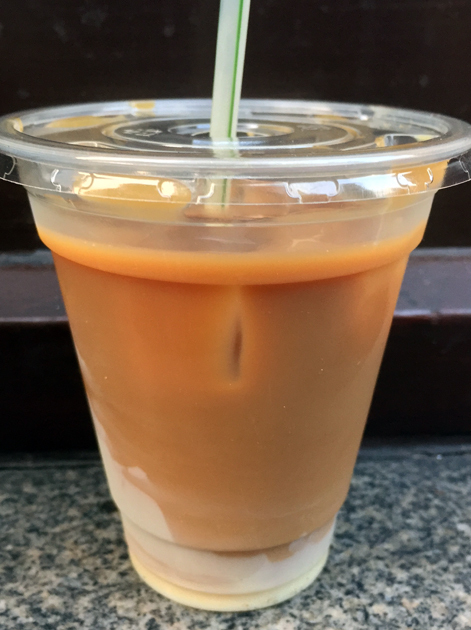 Oi Hanoi’s iced Vietnamese coffees were a bit small, but at least it’s not all condensed milk. 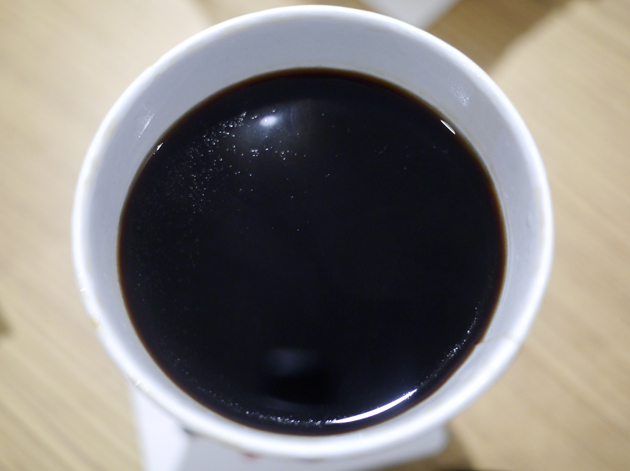 The dairy wasn’t laid on too thick, so its creamy sweetness didn’t overwhelm the brew. The black brew itself ranged from chocolatey and bittersweet to malty and lightly bitter – either way, it was surprisingly pleasing. 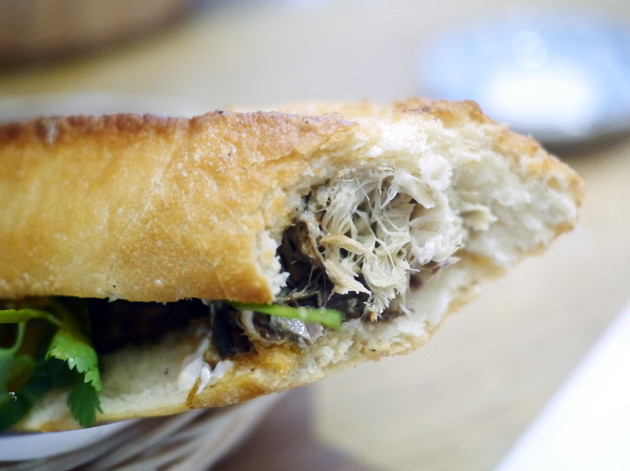 Oi Hanoi’s banh mi are off to a good start with quality breads and a surprisingly decent tofu and mushroom vegetarian option, but the meatier fillings need more care and attention. 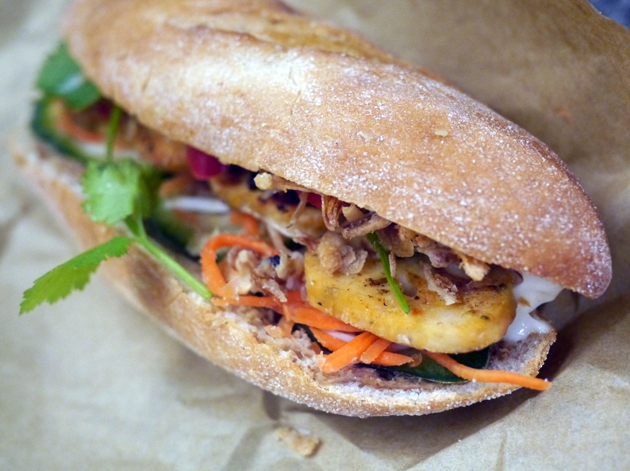 Viet Baguette is the new, unoriginal and SEO un-suited name of An, an eatery covered in my original banh mi round-up. It has also moved to a new larger location literally around the corner from its old one, with its former premises incongruously turned into a nail salon. 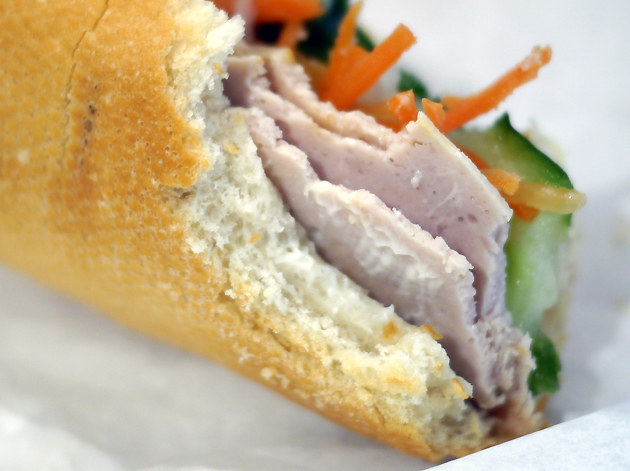 Despite the change in name and address, the banh mi are largely the same as they were before. Although the pork roll used in the Special wasn’t, well, special, the other two porky components helped compensate for its weakness. The thin pate was coarse and earthy, while the gently spiced pork slices had both some fat and rind attached which provided extra flavour and texture respectively. There was fresh coriander, but the pickled vegetables were more crisp than tart. The only real disappointment was the unremarkable brown baguette itself. The chunks of poultry in the spiced chicken variant were surprisingly good with a simple peppery, soy sauce-based basting that proved to be quite delectable. 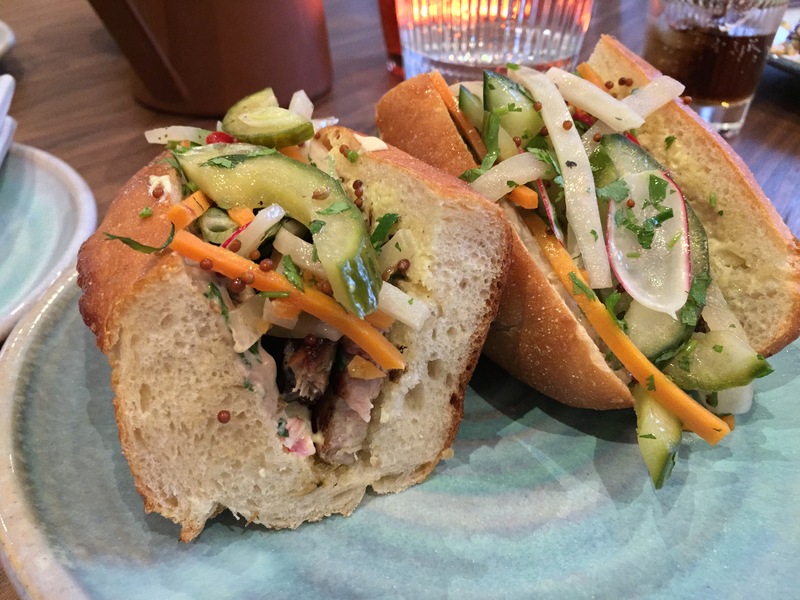 The rest of this banh mi, and indeed all those that follow, was otherwise identical to the Special when it came to the bread and accompaniment fillings. The other chicken options were grilled or satay chook. The latter might have been in the same room as some satay seasoning and sauce at some point, but you wouldn’t know it from the transient taste of the breast meat. It was instead largely dependent on a overindulgent plop of sweet chilli sauce for flavour instead. 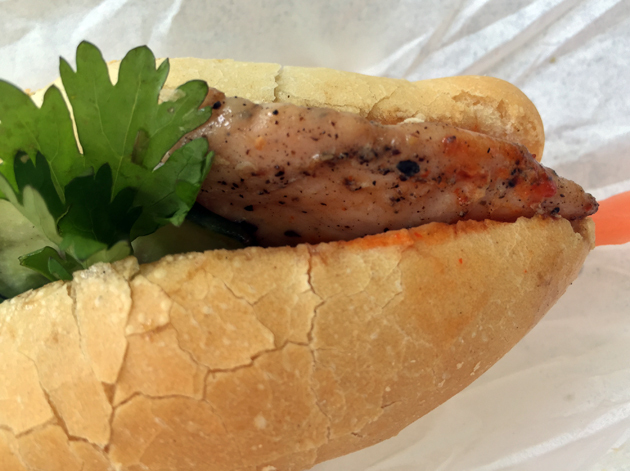 The grilled chicken was better – the tender breast chunks were lightly caramelised and complimented reasonably well by a daubing of creamy mayo and lightly spicy sriracha-style sauce. The chilli slices could’ve been punchier though. The variant filled with grilled pork was unsurprisingly similar to the grilled chicken, but with sweet, lightly peppery and spicy chunks of pig taking the place of the chicken. Although very light, the pepperiness of the pork was complimented nicely by the equally light tartness of the pickled carrots and daikon and the fresh coriander. The pork roll filling stood well on its own outside of the Special – milky and meaty. The shredded pork wasn’t quite fine enough to count as pork floss, resembling instead a joint of roasted pork vigorously rubbed up against the friendly side of a cheese grater. The roasted pigginess had occasional hints of fat and caramelishness, but swerved a little too closely to blandness overall so it’s just as well that there were blobs of mayo. If you prefer your pork a little chunkier, there’s the spiced pork. The heat of the spice barely registered on the Scoville scale though and passed even more quickly than a stereotypical English summer. It was at least a little fatty with chewy rinds. 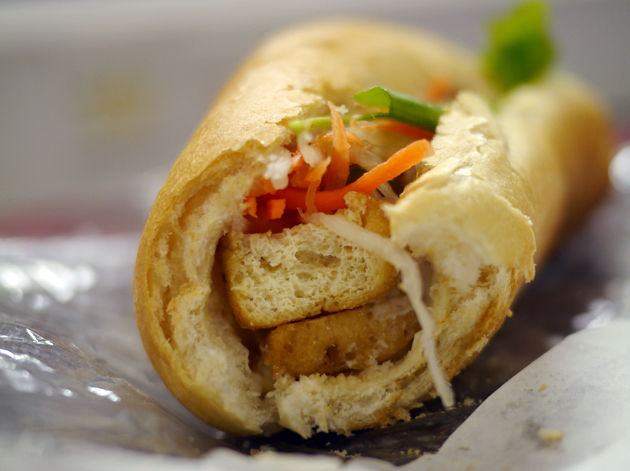 Viet Baguette’s very best banh mi turned out to be its vegetarian variants. The fried bean curd option saw firm, milky cubes of tofu breaded in a golden, lightly malty coating. The contrast between interior and exterior was a real highlight. 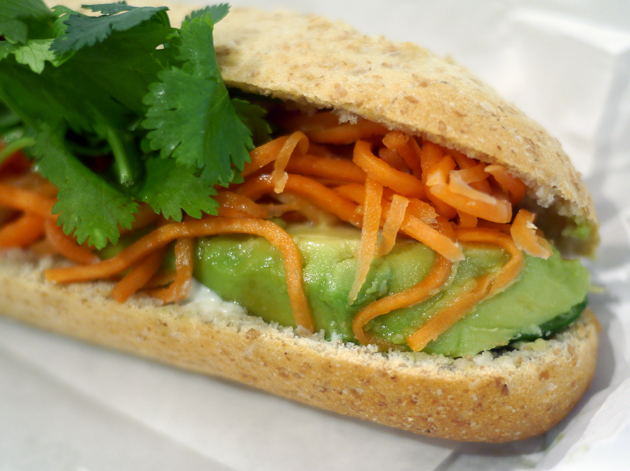 The banh mi filled with avocado worked not only due to the lightly sweet creaminess of the fruit itself, but also because of how the tartness of the vegetables complimented it. Aside from temperature, both the hot and iced Vietnamese white coffees were essentially identical. They had the same caramelish, slightly burnt popcorn-esque flavours and a mild caffeine kick. 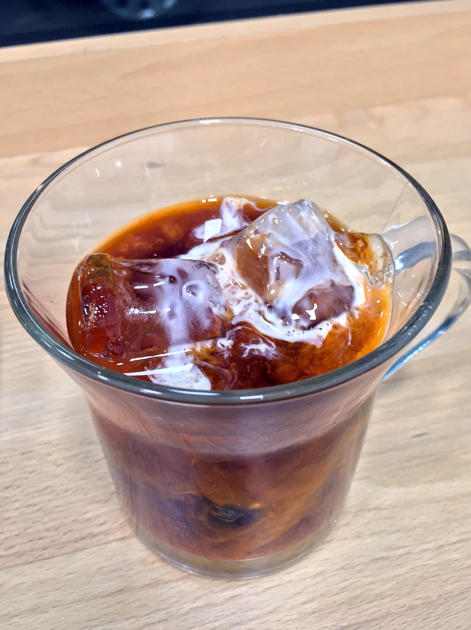 You can get the coffee black, but it’s a very different drink without the condensed milk – as well as adding caramelish tones, the milk emphasised the popcorn-esque taste of the brew itself and it’s much more subdued standing by itself. Still, very pleasing overall. 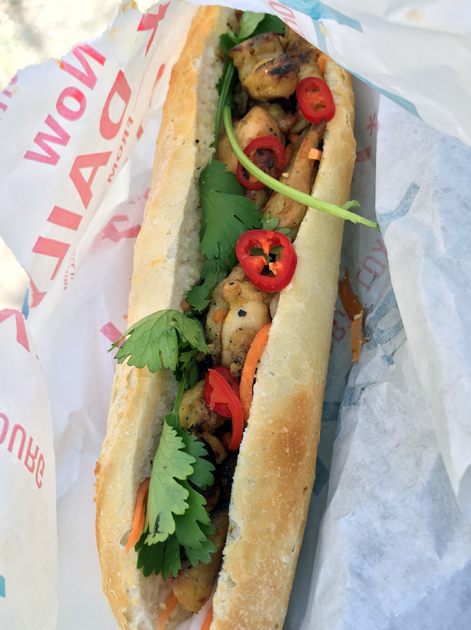 While Viet Baguette’s banh mi are no worse than they were before, the strength of the competition means that it’s slipped in the rankings. 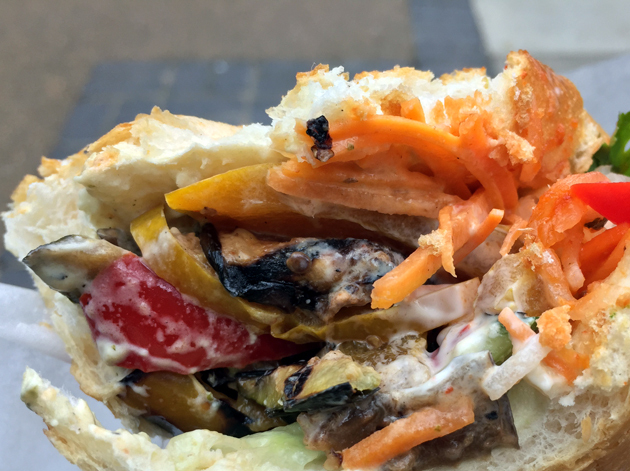 It’s still a perfectly good option for a Vietnamese sandwich though, both because of the strength of its vegetarian options and because the nearest alternative is Deptford’s Panda Panda. The unimaginatively named Vietnamese Street Food is a lunchtime-only stall at the Whitecross Street Market near the Barbican. Operated by Joe Dang (according to the publicly displayed traders’ licence), the stall officially operates Monday to Saturday from 10.00-17.00. 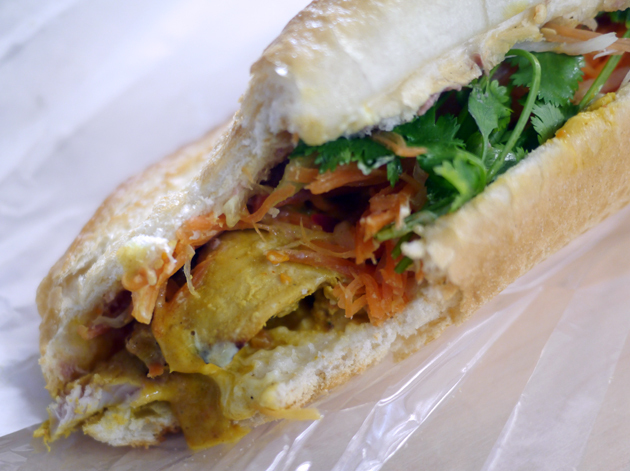 The banh mi can run out very quickly though, so don’t count on sauntering up whenever you like. 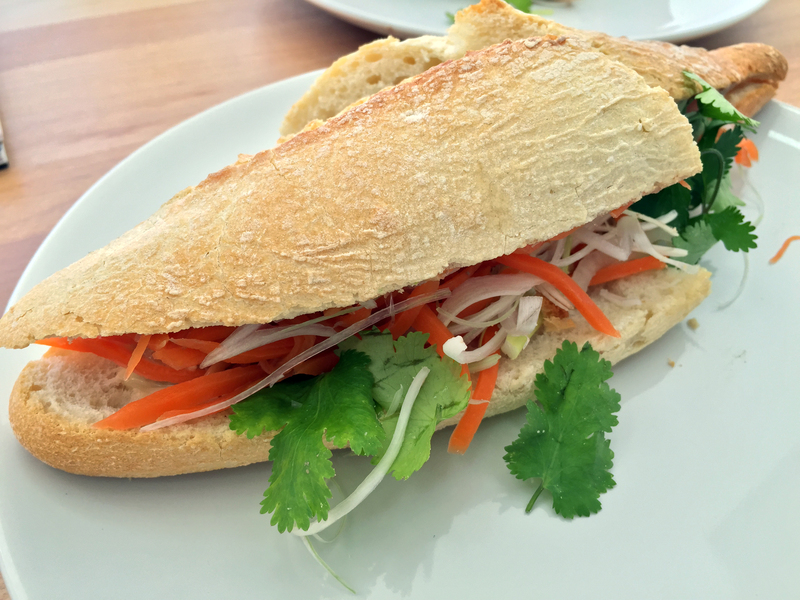 All of the banh mi used light, airy but also somewhat chewy baguettes. All were large, meaty and very filling. Oddly, there wasn’t a vegetarian option available on any of my visits. 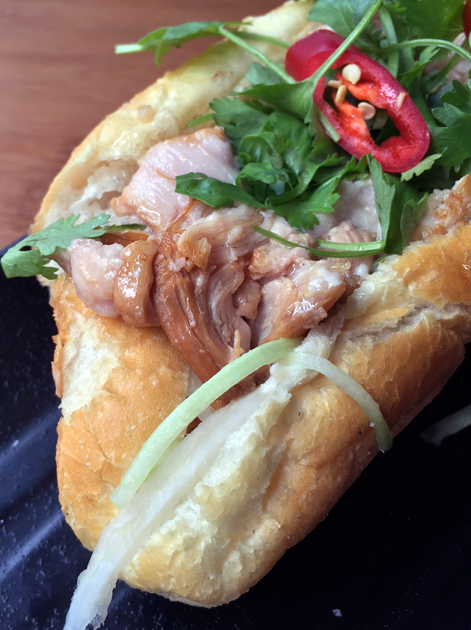 Pork turns up, in one fashion or another, in almost all of the banh mi. The crunchy crackling of the Crispy Pork was, surprisingly, the least interesting thing here. Instead it was the lusciously milky meat which stole the show. Its moist richness was balanced out by a selection of both fresh and pickled vegetables, as well as a hint of fresh chillies. The Caramelised Pork was much the same, but with caramelised sweetness coming not from the meat but from the sauce ladled on top. It was sticky and mildly fruity, without being too cloying. The same sauce turned up again with the Pork Meatballs. The coarse, meaty, lightly herby balls didn’t really need them though. 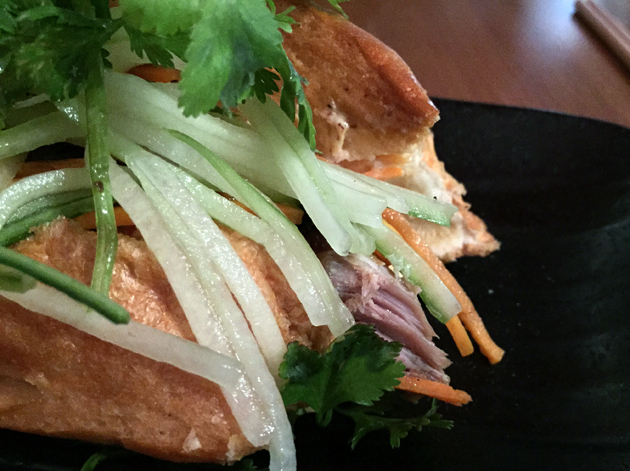 A few sprigs of coriander were all that was needed to crown this beautifully satisfying banh mi. The only pig that flopped was the Cha Siu Pork. Although the chunks of meat were moist and tender, they had only a very mild sweetness, with no salt or smoke present. The meat in the sole chicken option was entirely dependent on the nutty sauce which had a surprisingly strong taste reminiscent of fermented beans. This relative richness was nicely balanced out by the vegetables and chillies. 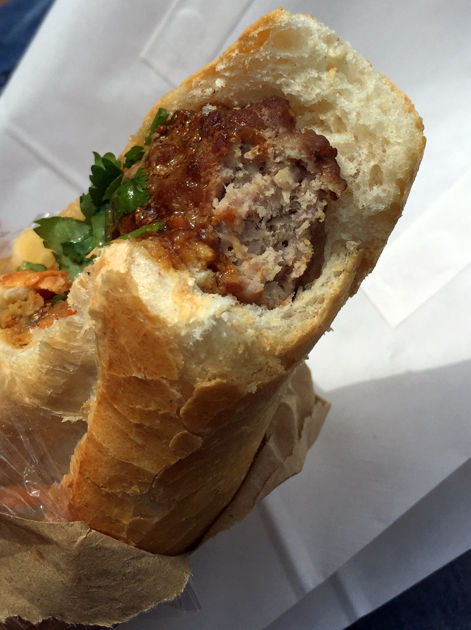 Although there’s still room for improvement at this market stall, from the bread to some of the meats and sauces used, the sheer quality of both the Crispy Pork and Meatball sandwiches means I’ll be getting very fat indeed at Whitecross Street Market. Whaam has a name lifted straight from the onomatopoeic sound effects in a comic book and this is matched by the Lichtenstein-style pop art lining walls, but with Vietnamese instead of English text. This is a small take-out only place that gets rammed at lunchtimes (it’s much quieter in the evenings), yet despite this the staff were universally friendly, warm and helpful. 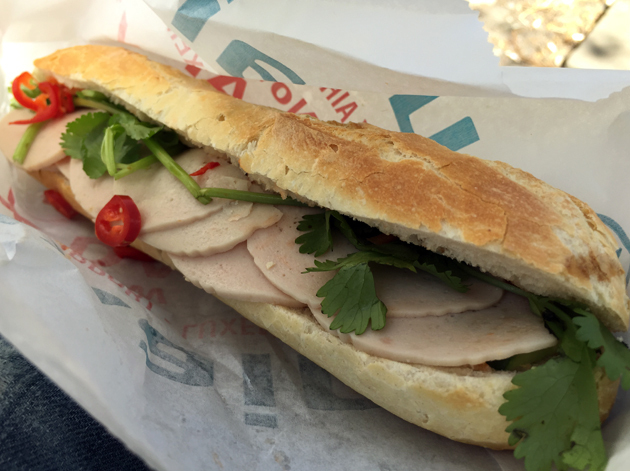 While the baguettes used in the banh mi were always light, airy and slightly chewy they tasted more like semolina flour loaves than rice flour ones, although I can’t confirm this. They’re still very good though, especially when filled with the beef brisket. The meaty chunks were tender, occasionally unctuous, always moreish and blessed with a gentle herby fragrance. There was a mild but flavoursome kick from the sriracha mayo, but it was still relatively weak – especially when compared to the tart pickled vegetables. 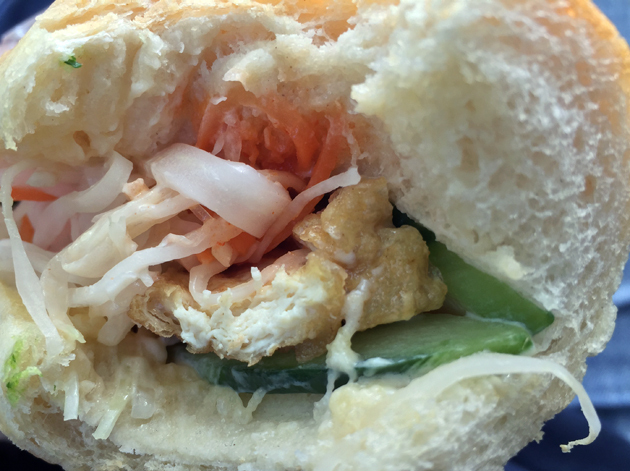 Although not everyone will enjoy the crispy, bread-like tofu, I enjoyed its lightness and it proved to be a surprisingly good way of ferrying the sriracha mayo and pickled vegetables into my mouth. 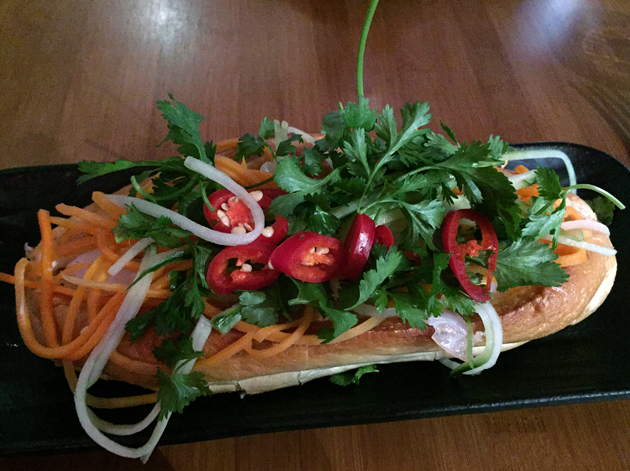 Tofu banh mi at Whaam. 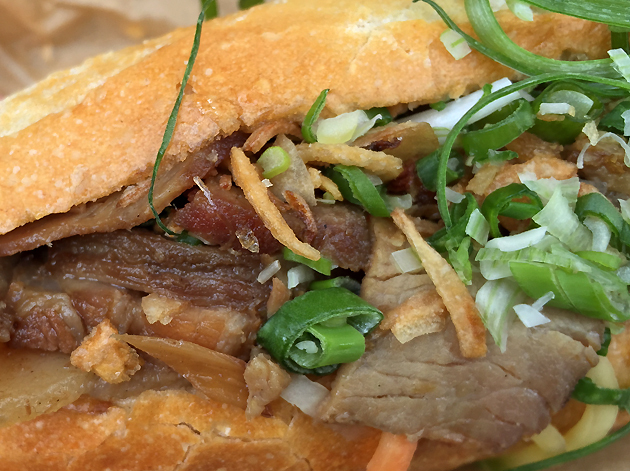 Yes I know this photo, and the one above of the brisket banh mi, are rubbish. The slices of Thai fishcake are the only pescatarian option and look like chopped plantains. They’re terribly bland though and barely livened up by the recommended lemon mayo which was only occasionally zesty. 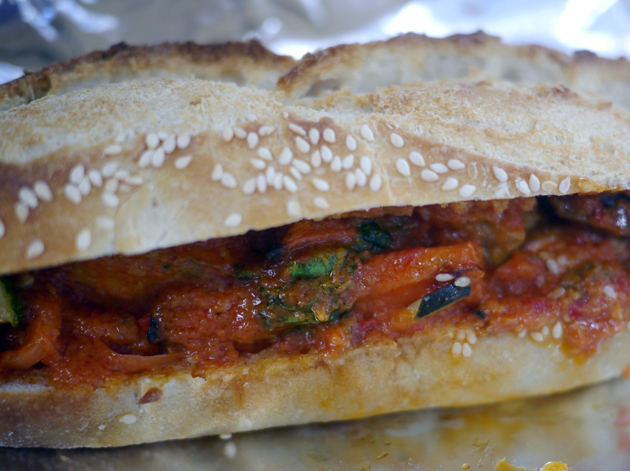 This sandwich was therefore dependent on the the coriander, slices of chilli, crushed nuts and tart veg for flavour. 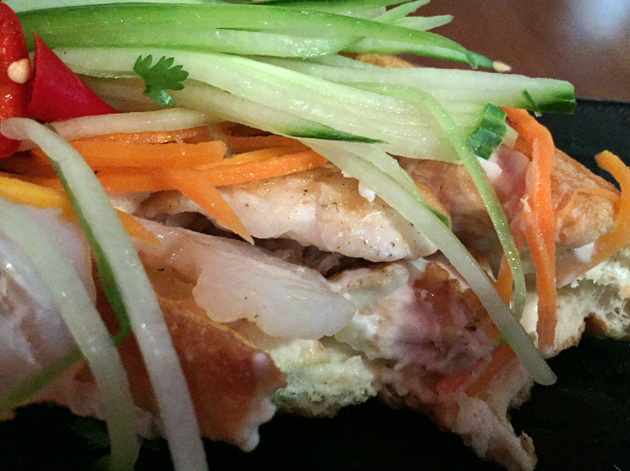 It was a similar story with the lemongrass chicken variant. The chunks of poultry were moist but inoffensive, while the matching chicken pate was equally bland. The ‘wasabi’ mayo was nothing of the sort. Far better than either of those two was the pork. Although advertised as ‘shredded’, the swine flesh thankfully came in substantial chunks instead. They were tender and occasionally unctuous thanks to the rivulets of fat and odd seam of connective tissue. The pork had gentle tinges of ginger which goes well with the tart veg, but as with the chicken banh mi above, the limp chicken pate and wasabi mayo left much to be desired. 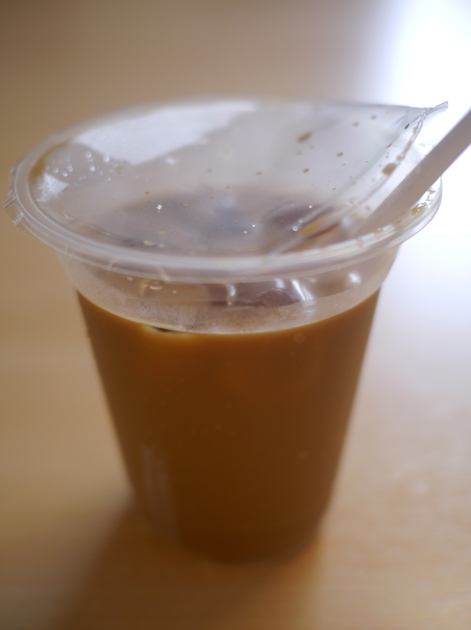 After multiple samplings, I can safely conclude that the iced Vietnamese coffee is mostly pants. 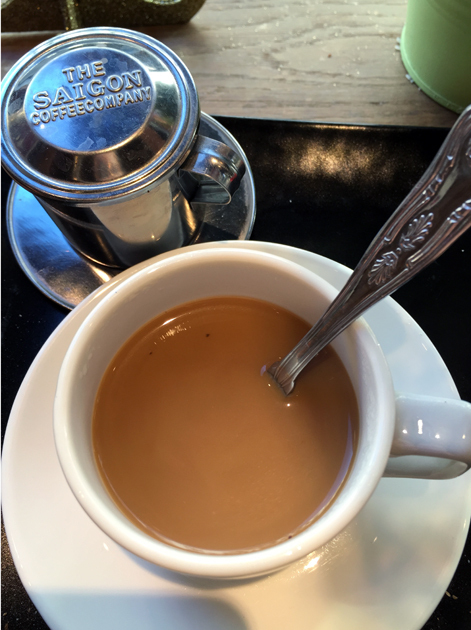 The watery, tasteless brew is nothing without the condensed milk. 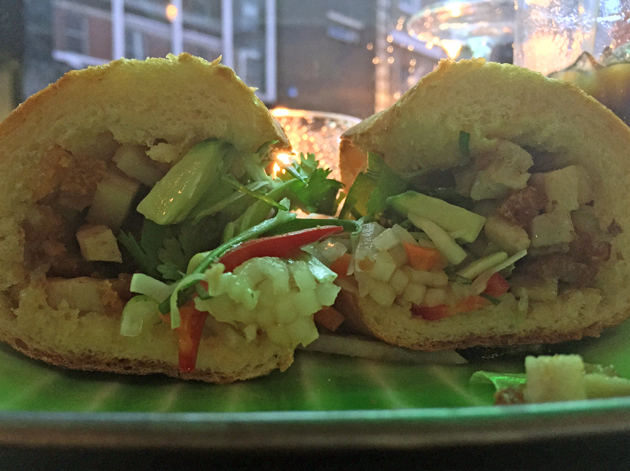 Although Whaam’s fishcake and chicken sandwiches are best avoided, the rest of its banh mi are top notch. 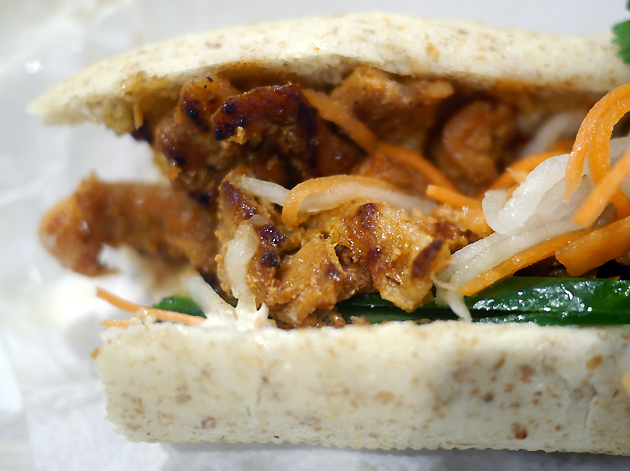 Slowly but surely, in fits and starts and short bursts, London’s choice of quality banh mi is improving. 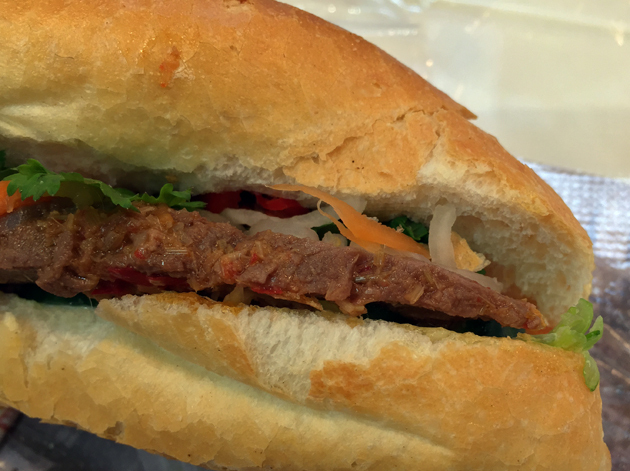 While some eateries such as New Saigon Cafe are still struggling with the basics of what makes a good banh mi, others such as Pho Viet 68 and Carrots and Daikon have achieved a consistently satisfactory level, if still not quite exceptional level of sandwich making. If other lunch stops, cafes and restaurants can achieve at least this level of accomplishment, then I’d be pleased but such gains are tenuous, especially given the still low public perception of banh mi and the fickleness of London’s eating out scene. 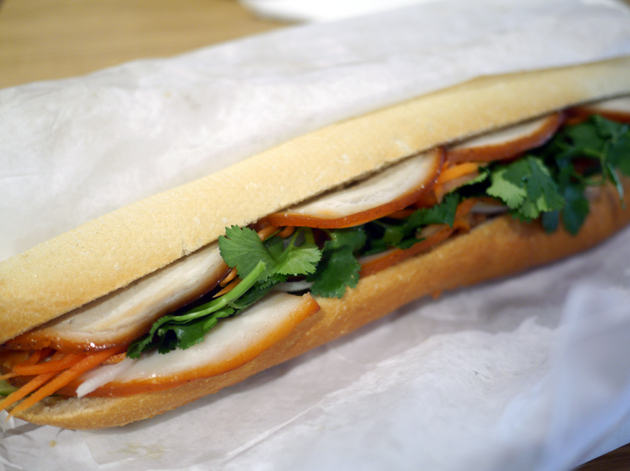 This makes Moba’s roundly unsuccessful attempts at modernising banh mi all the more ill-advised. 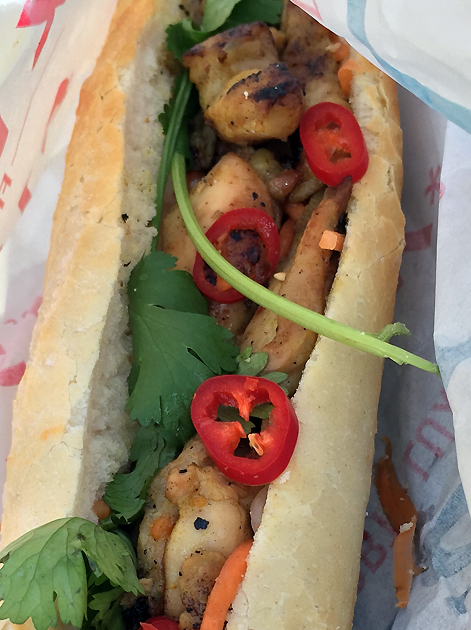 At the other end of the scale are top-notch vendors Little Viet Kitchen and Vietnamese Street Food at Whitecross Street Market which came close to dethroning Keu. 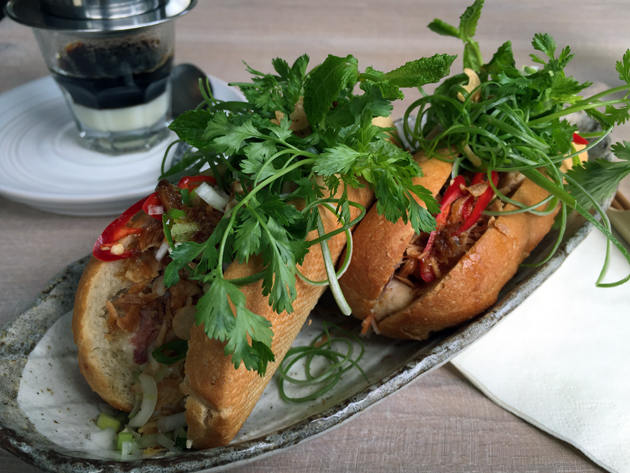 Judging from the efforts of its Soho branch, Keu still makes great, high quality banh mi. Even if Keu didn’t suffer from the odd wobble here and there, it would still have to share the limelight with newcomer Whaam. 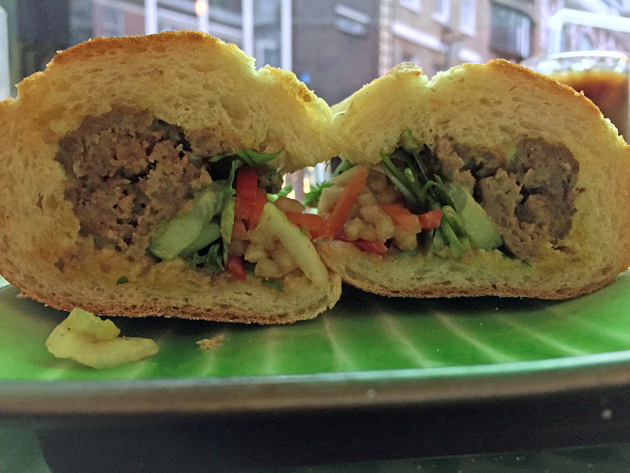 Although it’s not perfect either, the superb quality of this hole in the wall’s banh mi is all the more laudable given its central location and dinner time service. 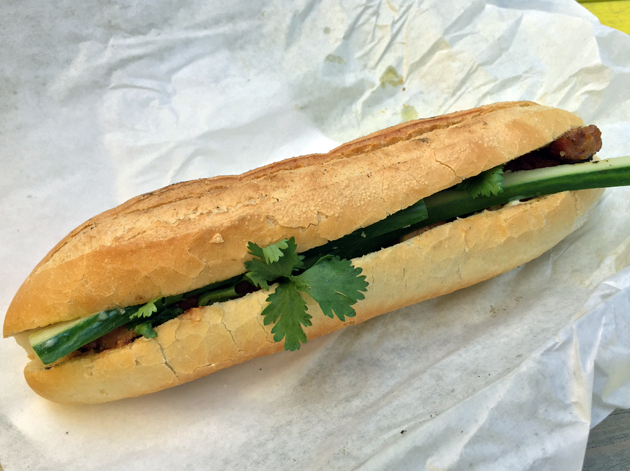 London’s very best banh mi from Keu, Whaam and Little Viet Kitchen aren’t cheap, but sometimes you really do get what you pay for. 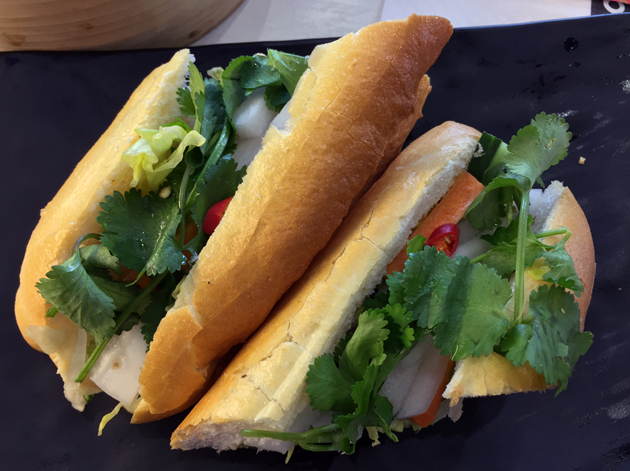 Tags: baguette, banh mi bicycle, banh mi town, bánh mì, best and worst, caphe house, caphe pho, carrots and daikon, cyclo, east street, hop, house of ho, keu, leicester place, little viet kitchen, london, moba, new saigon cafe, pho viet 68, restaurant, review, sandwich, whaam banh mi, whitecross street market. Bookmark the permalink.